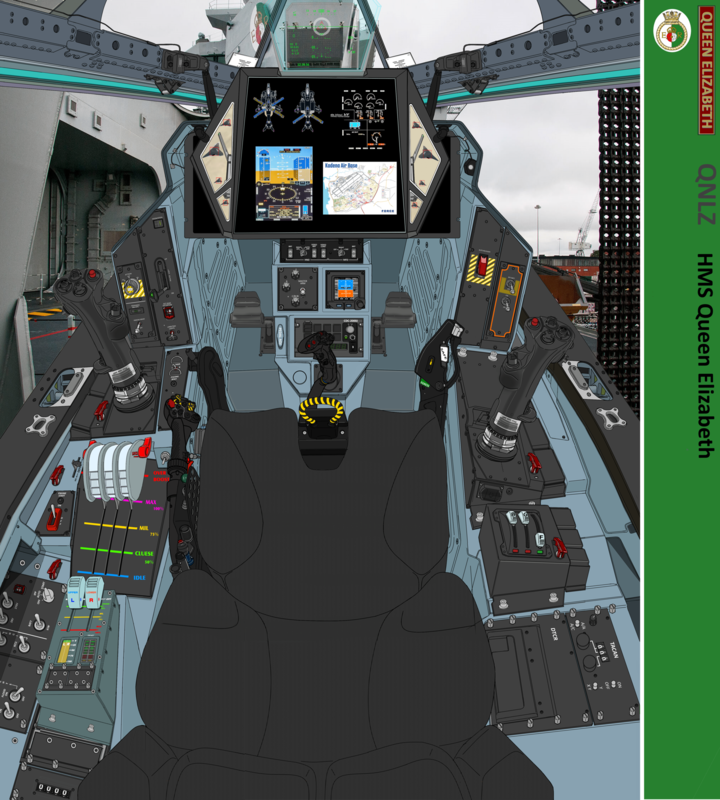 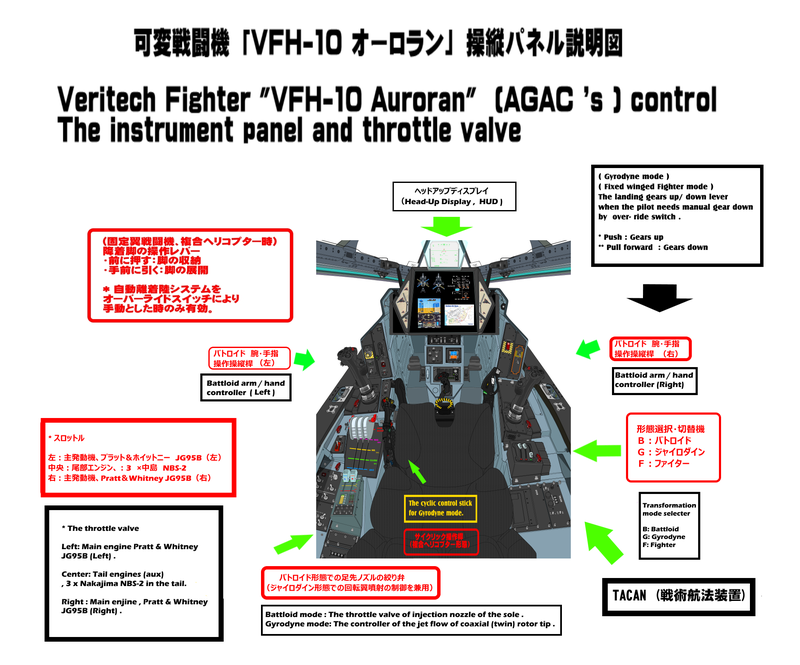 2014年 3月 20日[金] 作画 VFH-10 "J型"
"Da' Vinci II" hand and five-finger manipulator precise control system for Battloid mode. 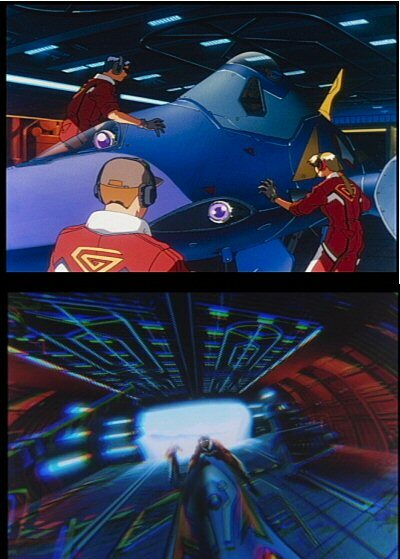 YF-21オメガ・ワン（Ω１）評価試験飛行前の調整作業場面より。Brainwave Control System (BCS) and Brain Direct Imaging (BDI) system. 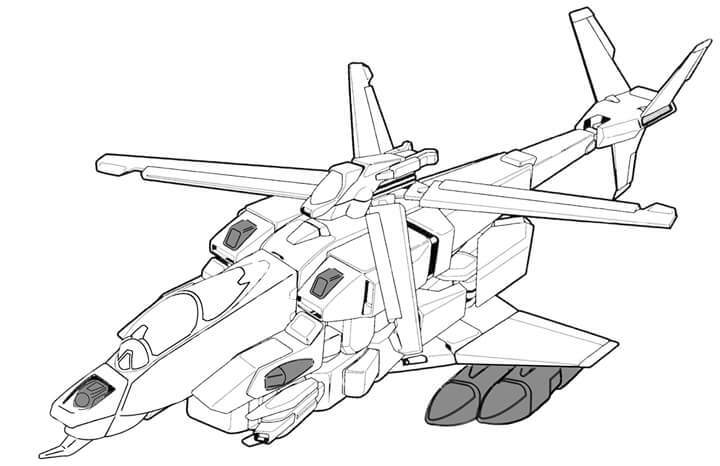 This aircraft transforms into fixed X - wing mode slightly before the helicopter 's never - exceed speed (Velocity never extended , Vne. 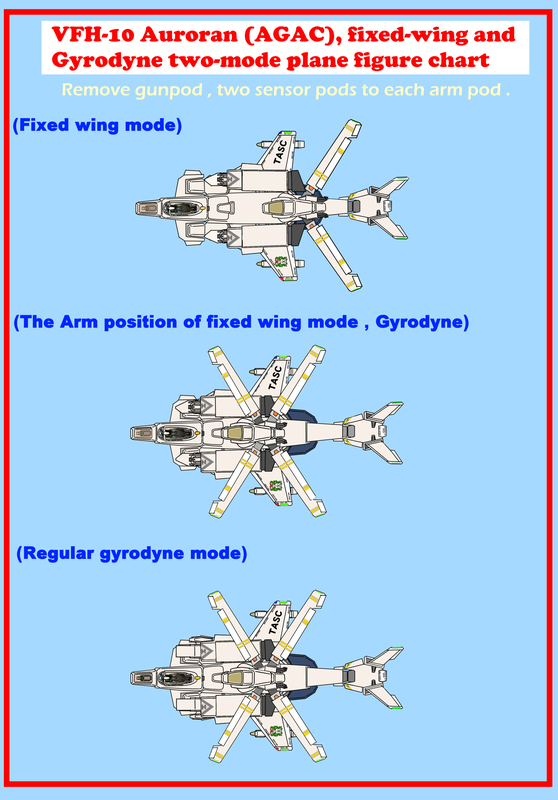 ), And when it gets faster, fixed X - wing is retracted and "Y" is inverted the aircraft transform it into high speed jet mode with swept wing. 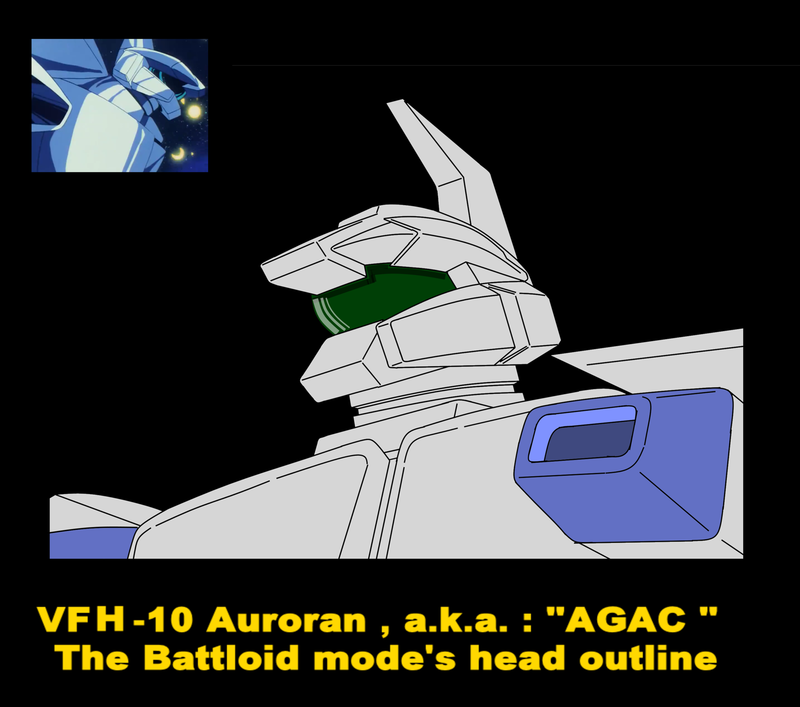 Now I try to analysis of AGAC roter head. 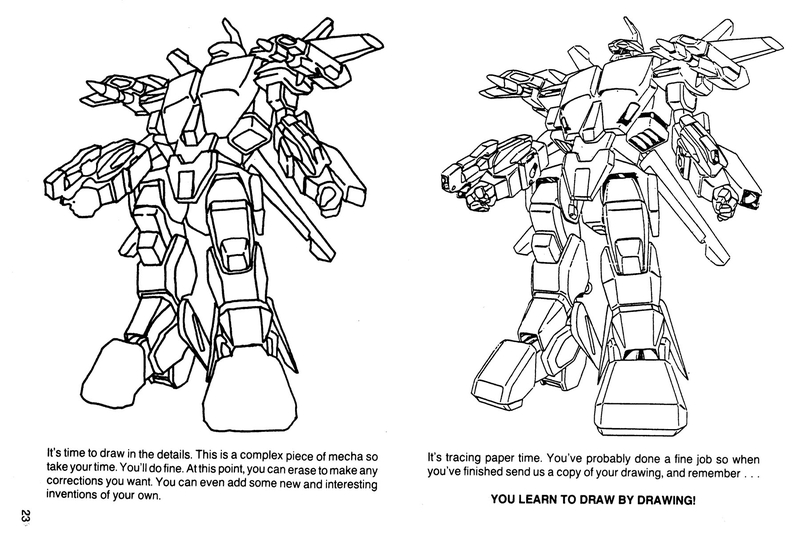 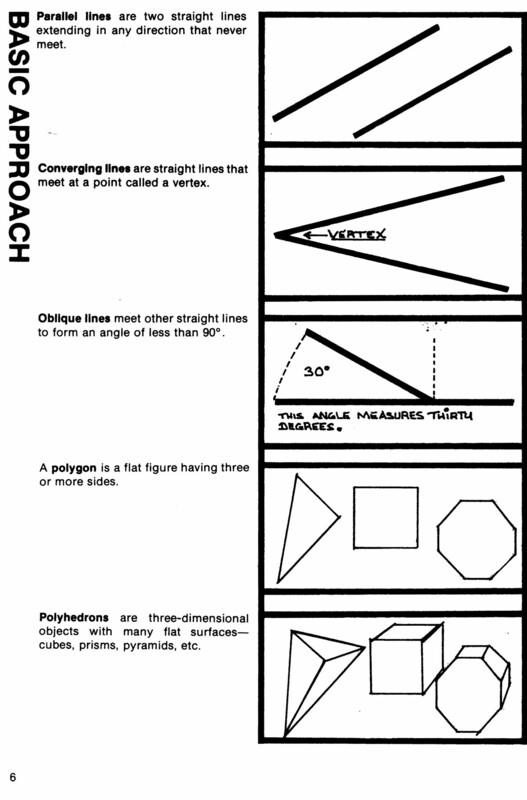 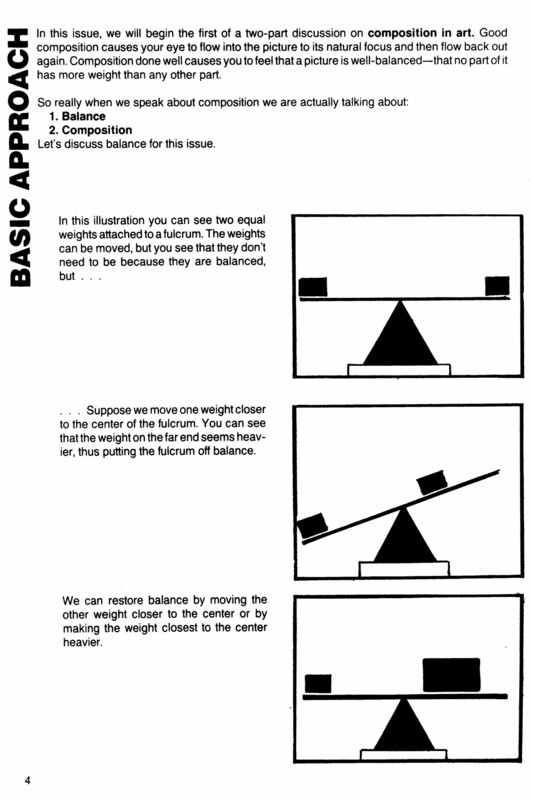 But original designers' color art was vague-and low pixels. 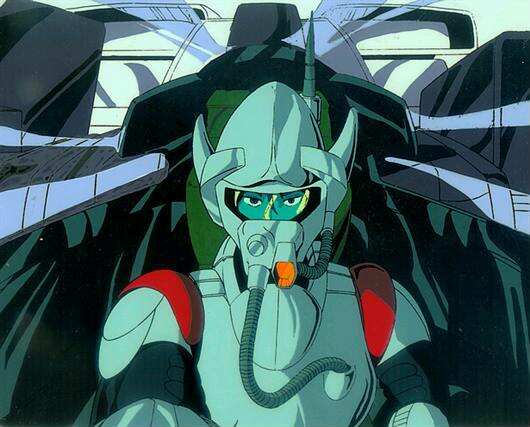 I cannot continue to analysis of roter head. 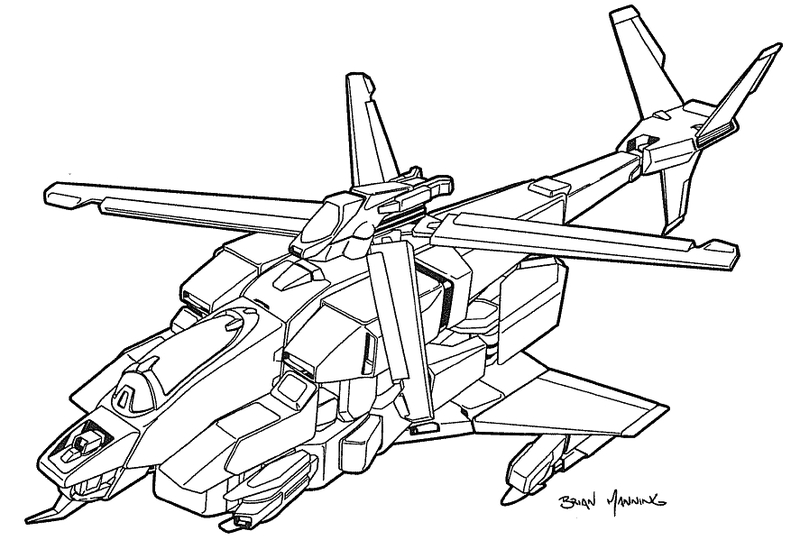 I seek AGAC helicopter mode lineart (original designers' one) ! 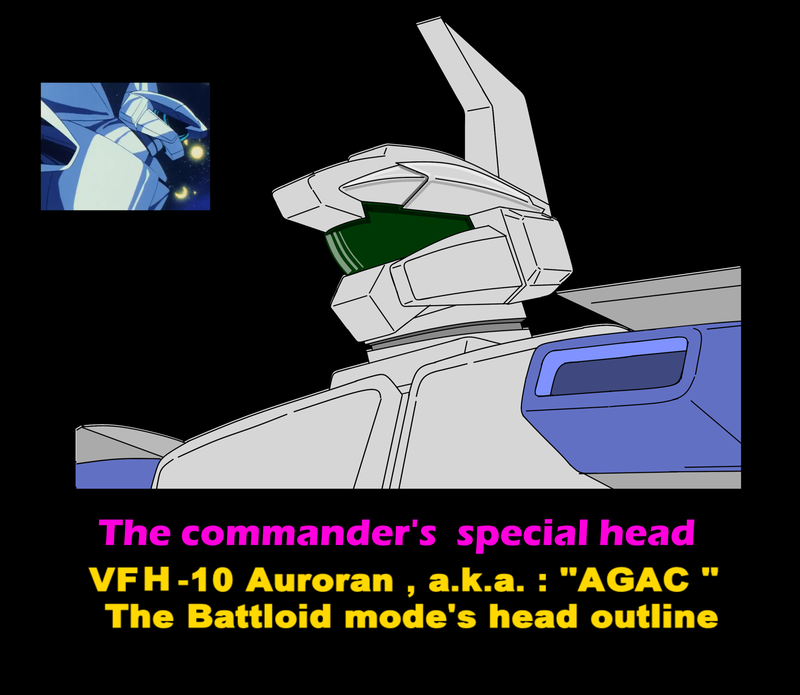 His incorrect interpretation by Mr. Brian Manning (from the red to blue shaded part) causes inconsistency in deforming to Battloid mode. 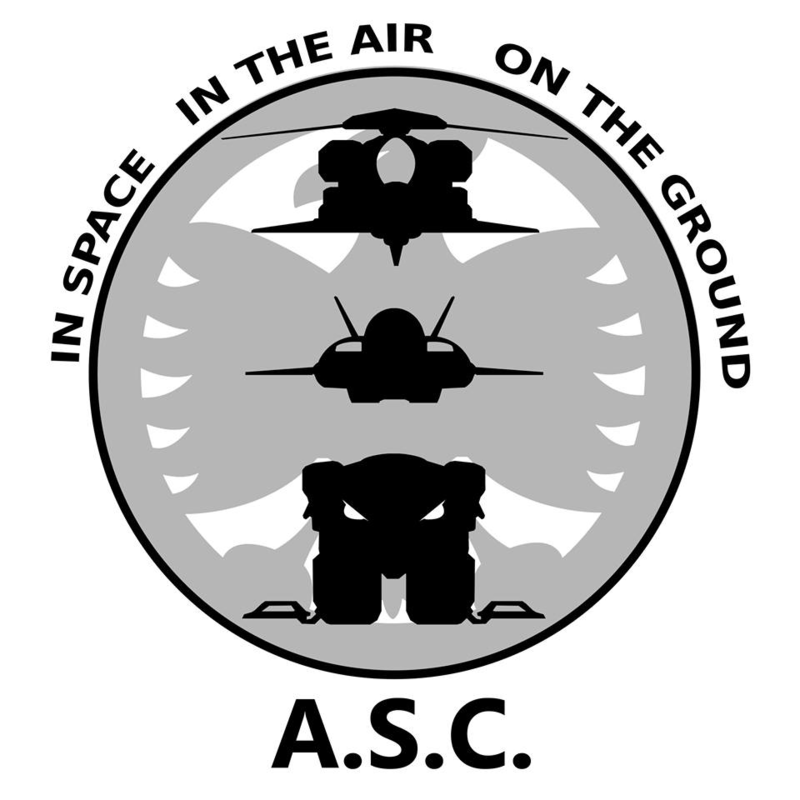 TASC , judging from the depiction in the film despite the space is a sphere, it has been operational as a guerrilla squad that cooperate with ATAC to drop into the atmosphere. 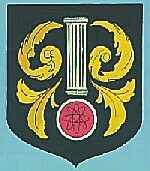 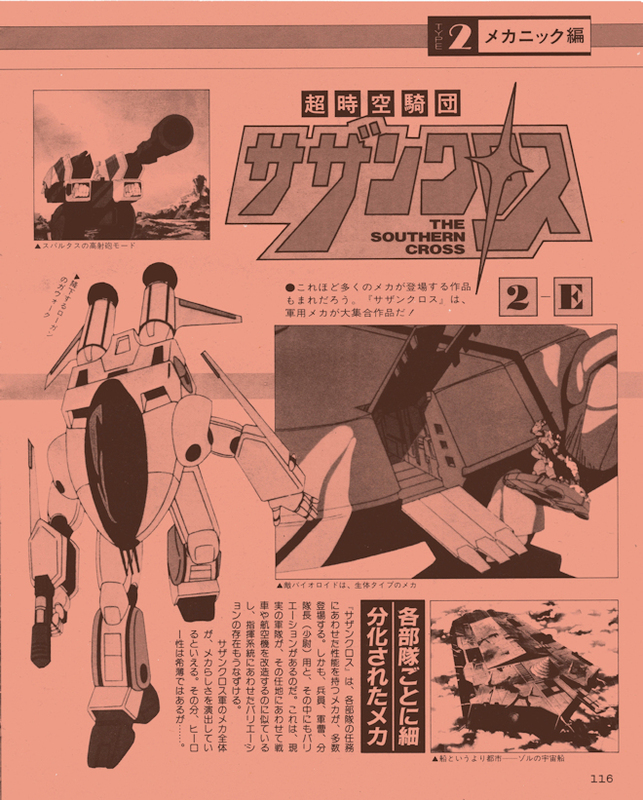 In view of it, Army of Southern Cross (ASC) was considered there may be Navy and Marine Corps are so poor, branch office of TASC to cooperate in the same way the Marine Corps or the Navy . 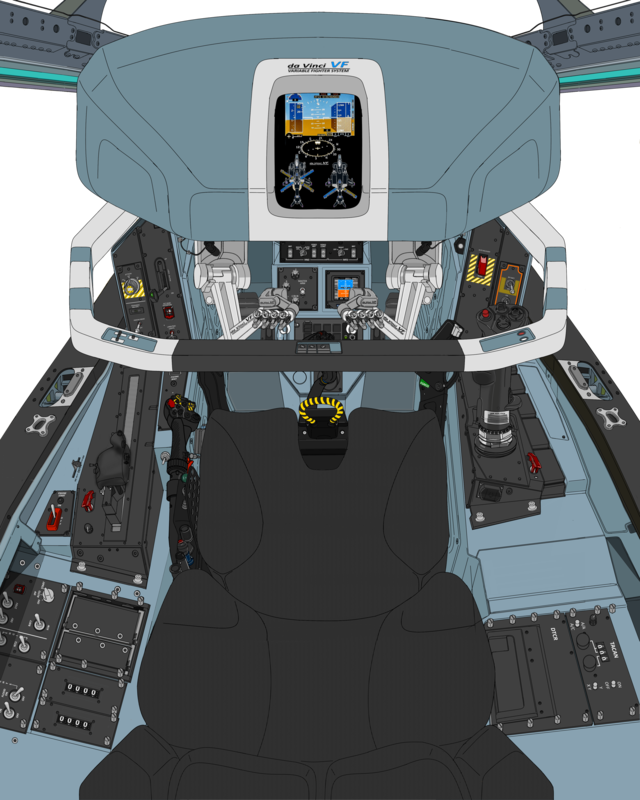 Original PNG (3.66 MB) , 5048 pixel x 3422 pixel image file has downloadable on Devintart URL as follows. 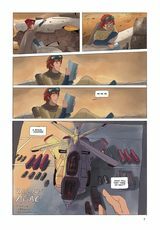 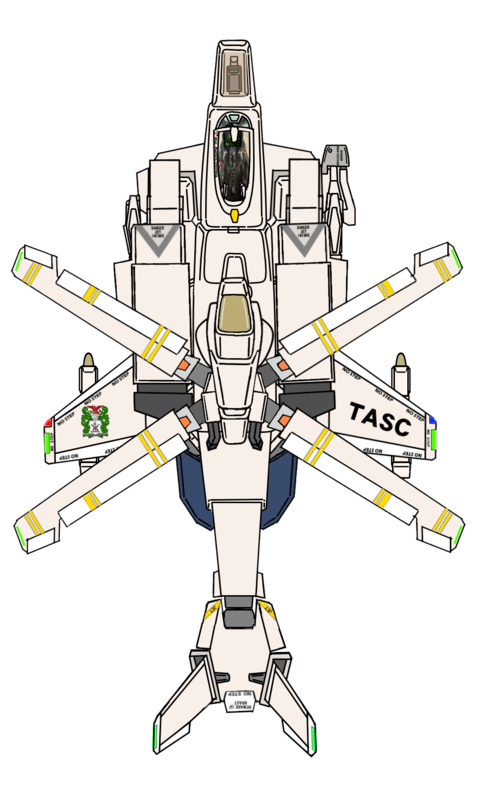 Alternative universe: Silvie is an ace Tacachiphov Inc. Valkyrie II variable fighter pilot and commander of the Faerie Squadron. 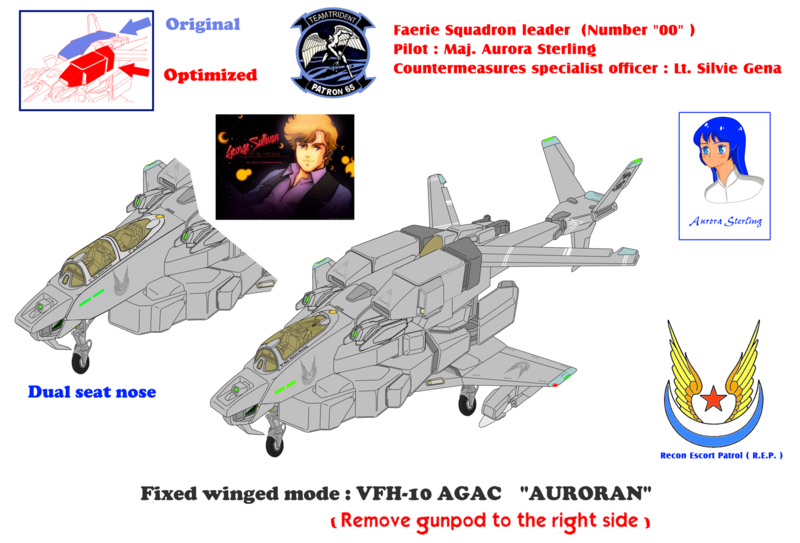 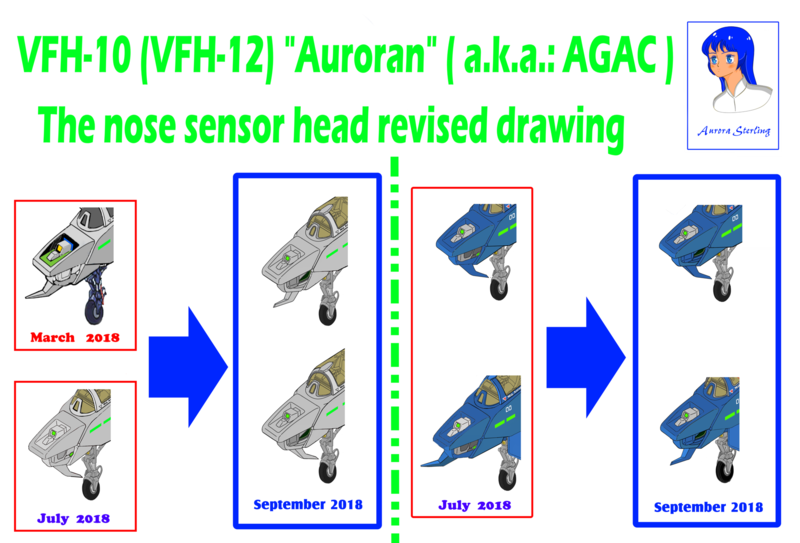 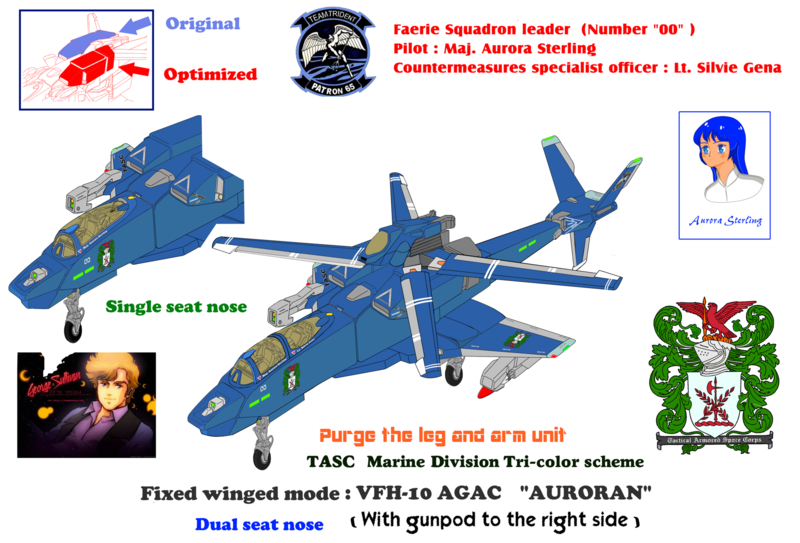 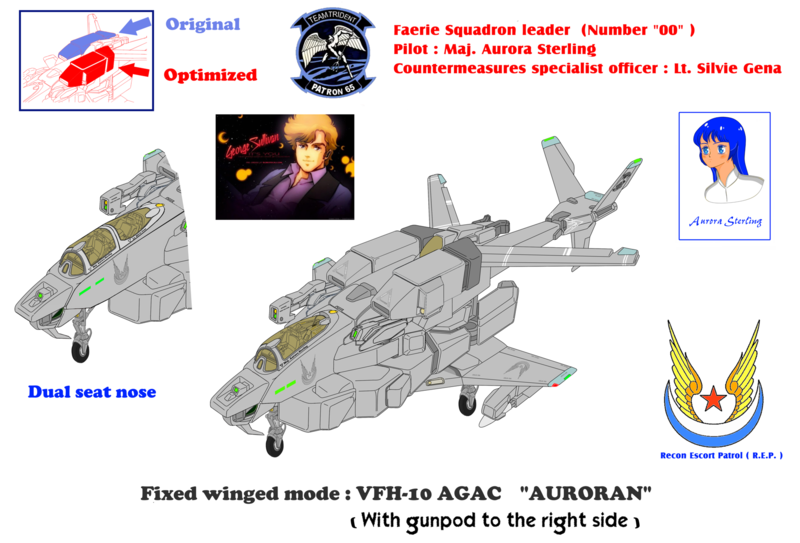 Low vislity glay color scheme VFH-10R AGAC "Auroran" ! 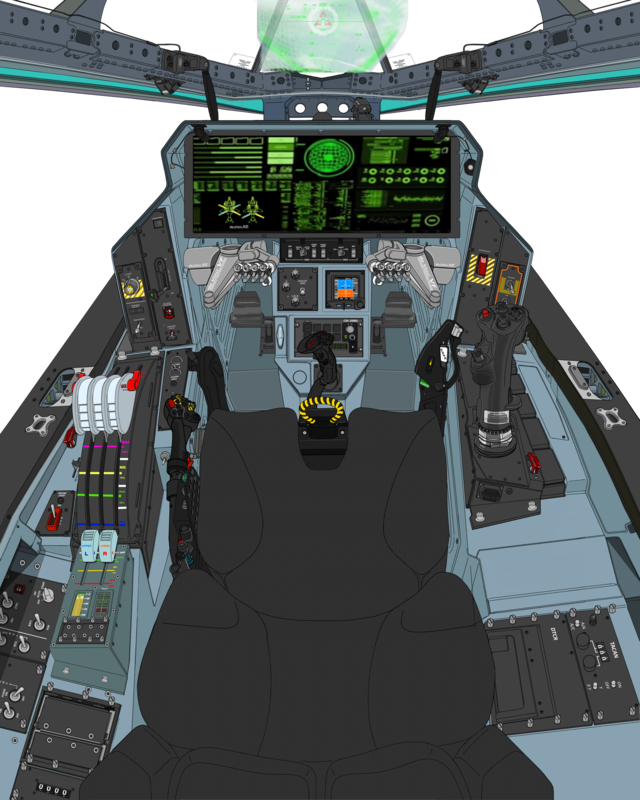 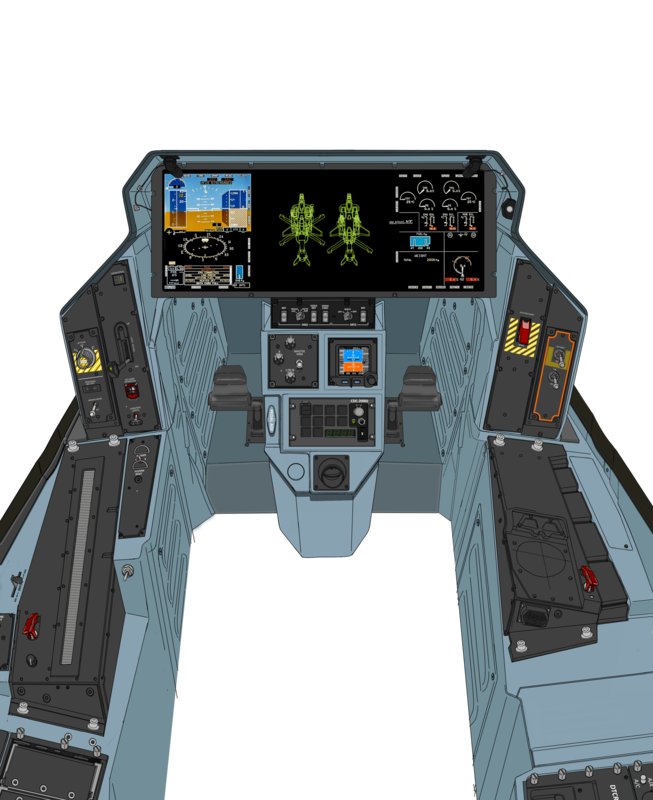 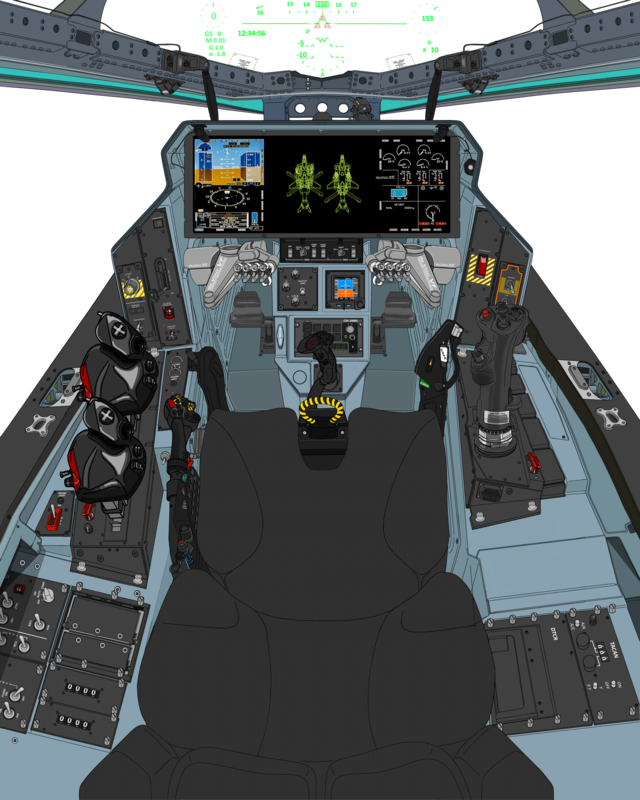 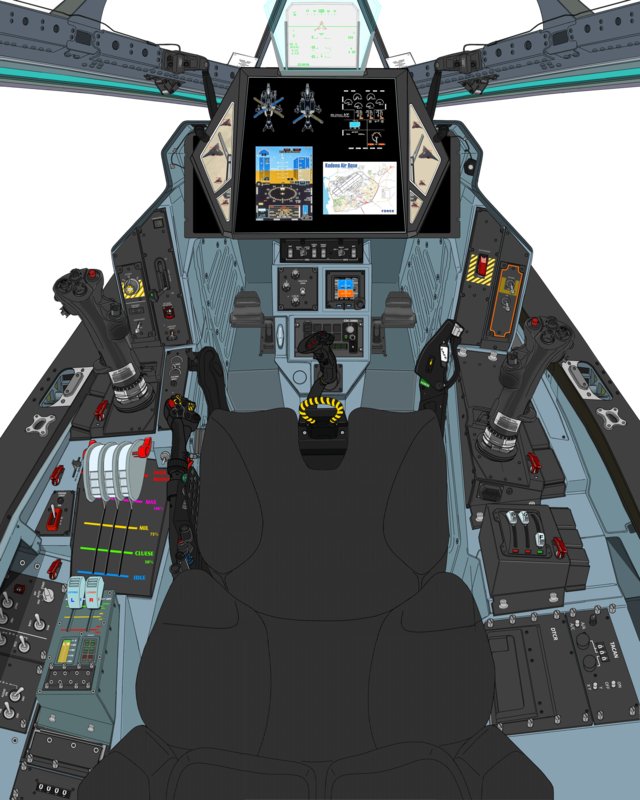 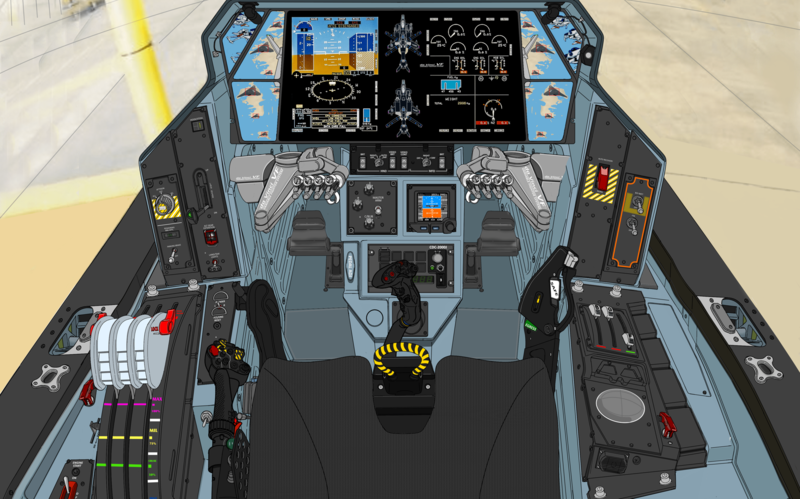 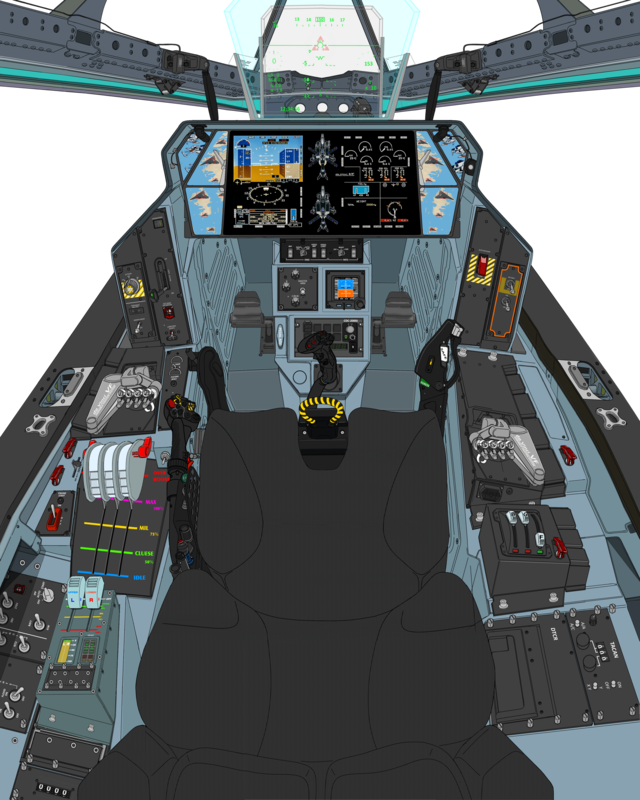 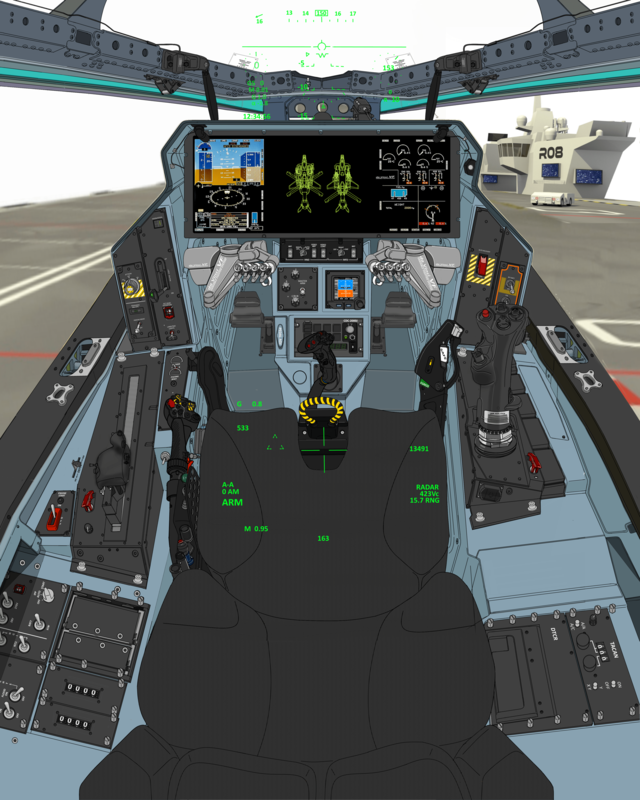 クリックにて 730 pixel x 331 pixel 原寸画像を展開します。This illustration shows the extended cockpit that would carry the pilot and his countermeasures specialist officer . 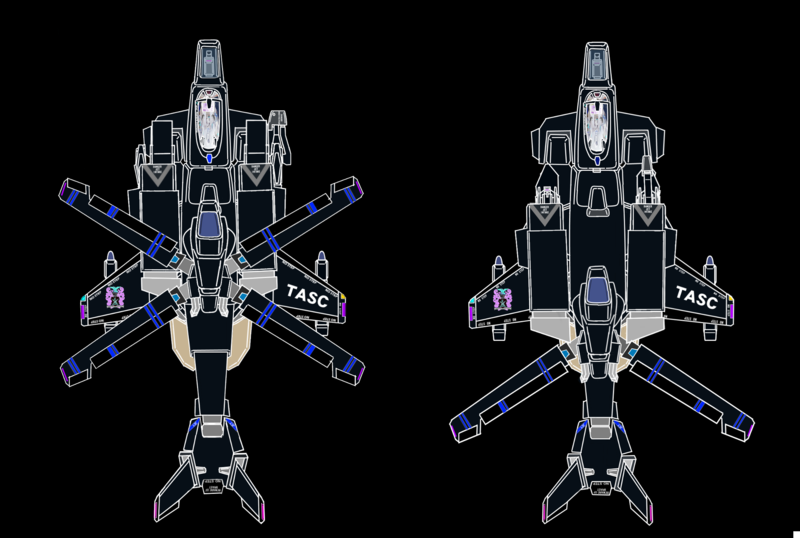 クリックにて 720 pixel x 466 pixel 原寸画像を展開します。The dark areas highlight the surveillance pods that would help it perform its the duties. 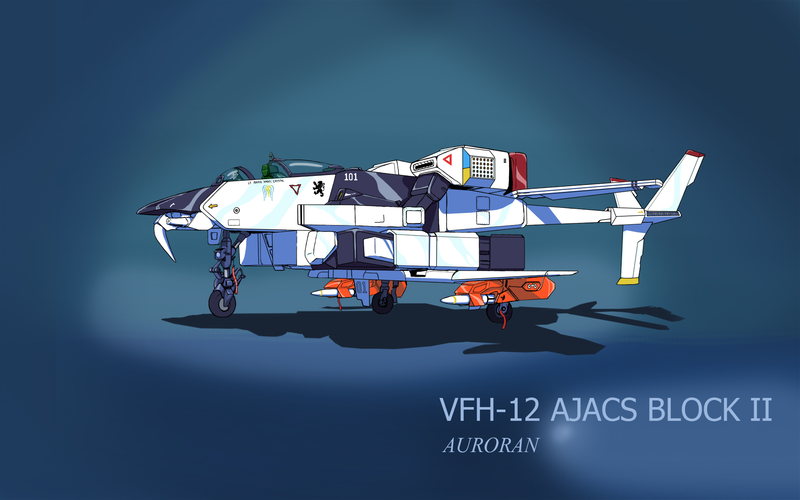 The VFH 10R was a reconnaissance variation of the AJAX that was rarely seen on the battlefield and that very fact proved how effectively stealthy it performed its task. 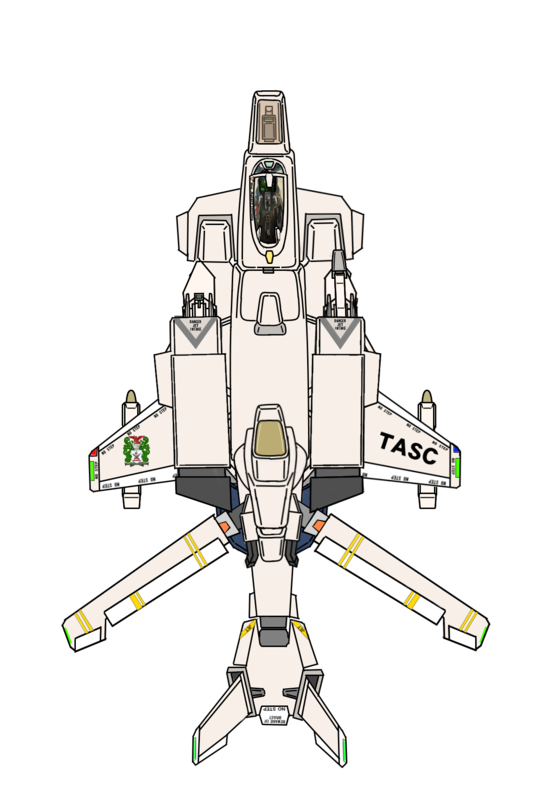 Packed with an electronic surveillance cluster of observation pods it would enter the scene unnoticed and retreat just as quietly. 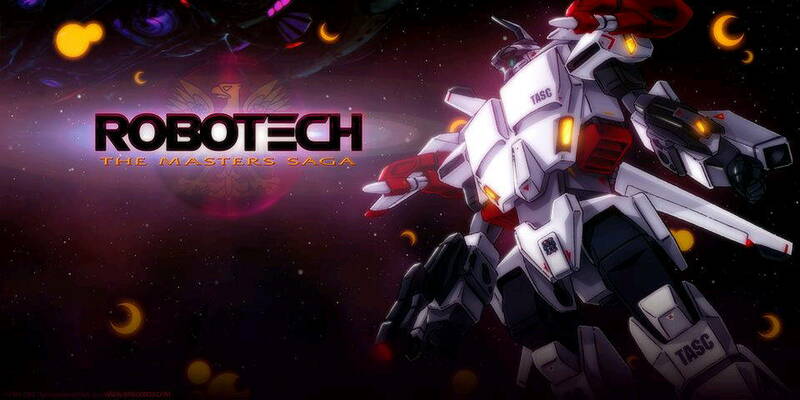 The data it brought back was put to very good use in planning future campaigns against the forces of the Robotech Masters. 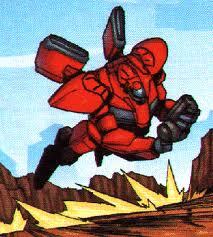 Few have popped up during the Invid Resistance era but more are thought to still exist. 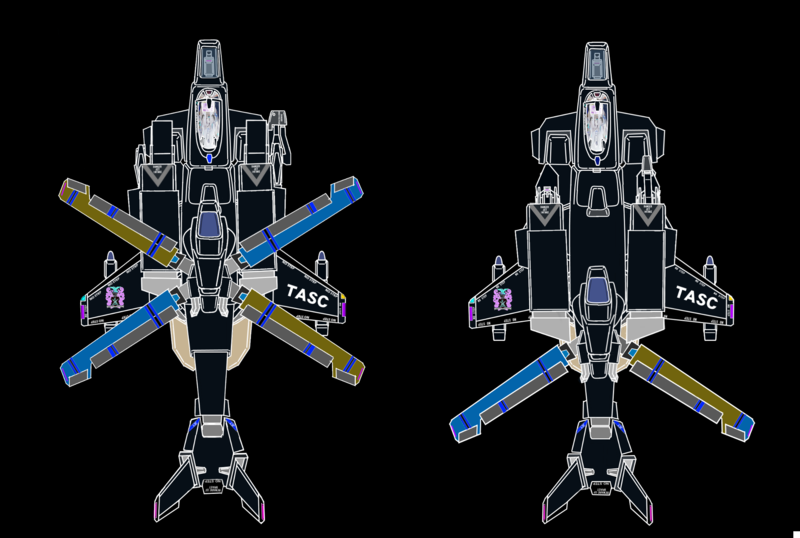 Returning from a shake down cruise to the outer planets of the Solar System, an Army of the Southern Cross TASC flotilla unexpectedly encounters the Masters fleet in high Earth orbit. 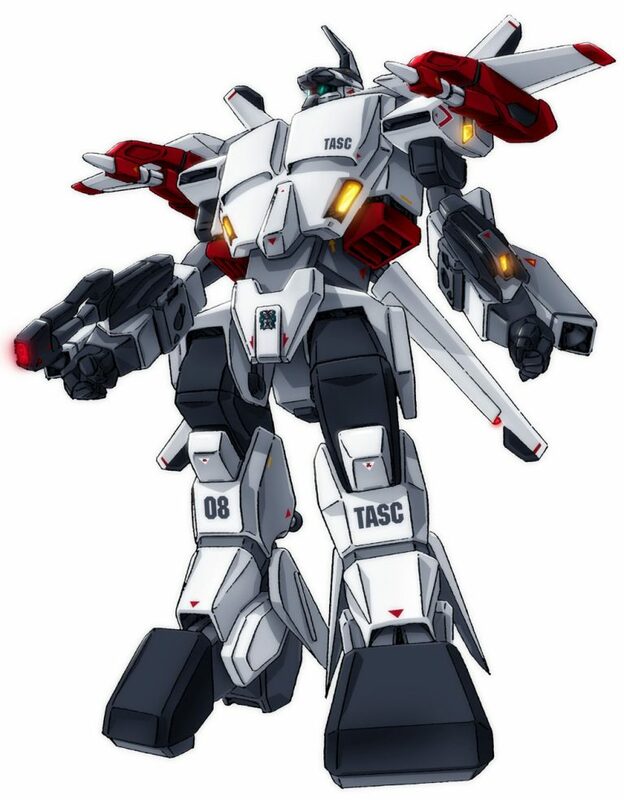 In the ensuing clash, the Tactical Armored Space Corps (TASC) newest Veritech the VFH-10X is baptised by fire. 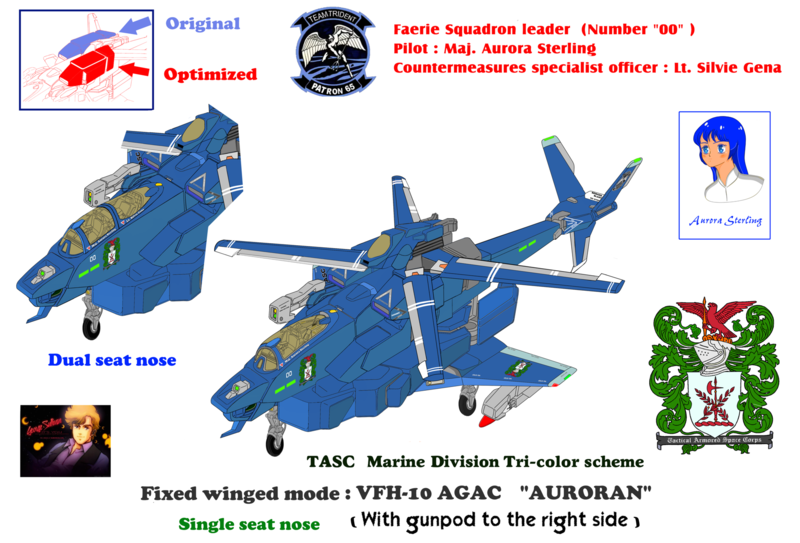 The performance of the Armored Gryro Attack Chopper (AGACs) was deemed exemplary against the nimble Bioroids attack craft of the Masters, and soon after the type was ordered into full production as the VFH-10A Auroran. 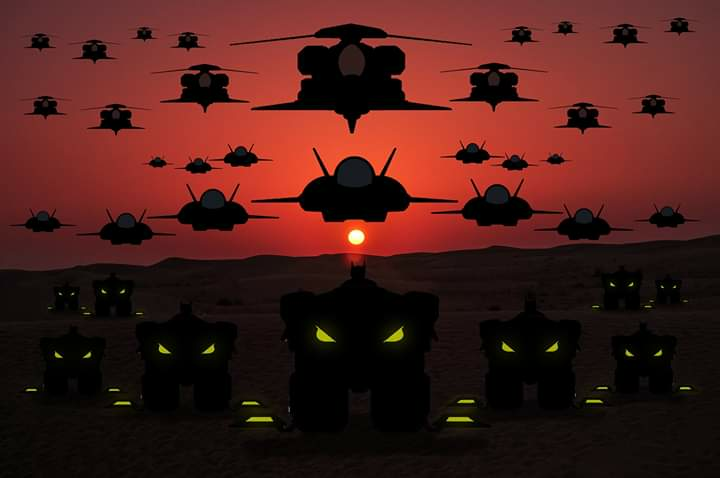 Here an Auroran carrying the Modex 222 is captured amid the brief battle as the 23rd Strike Group skirts the picket ships of the Masters fleet on their return to Earth. 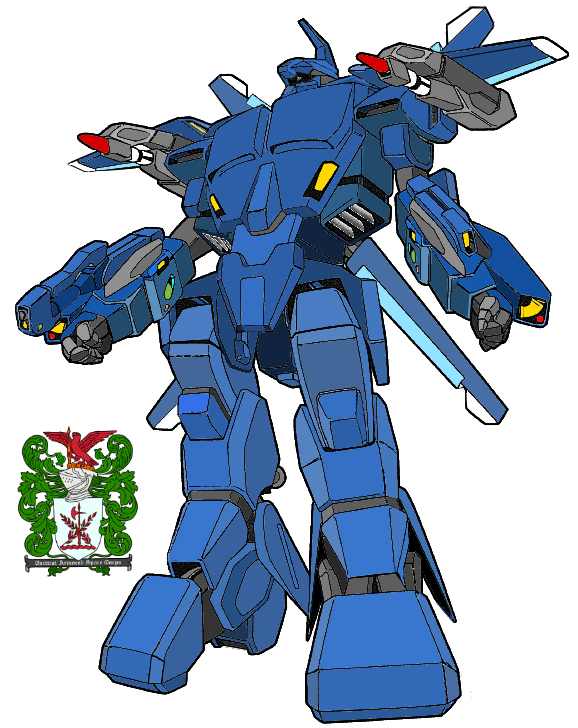 222 piloted by LCDR William Vance, callsign "Green Knight", served with distinction claiming 3 unidentified Battloid-type Mecha riding large "Space Surfboards" as several pilots recounted their first look at the Master's combat mecha. 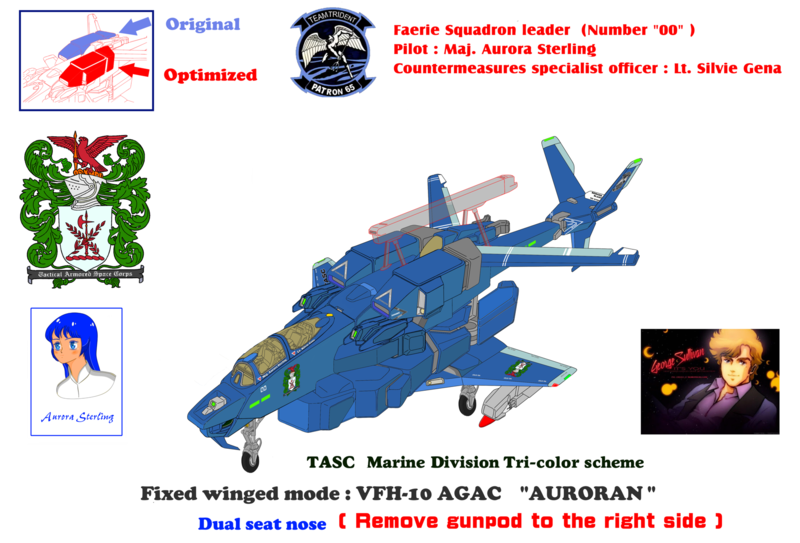 LCDR Vance rose rapidly through the ranks of the TASC to eventually command one of the first active Auroran squadrons. 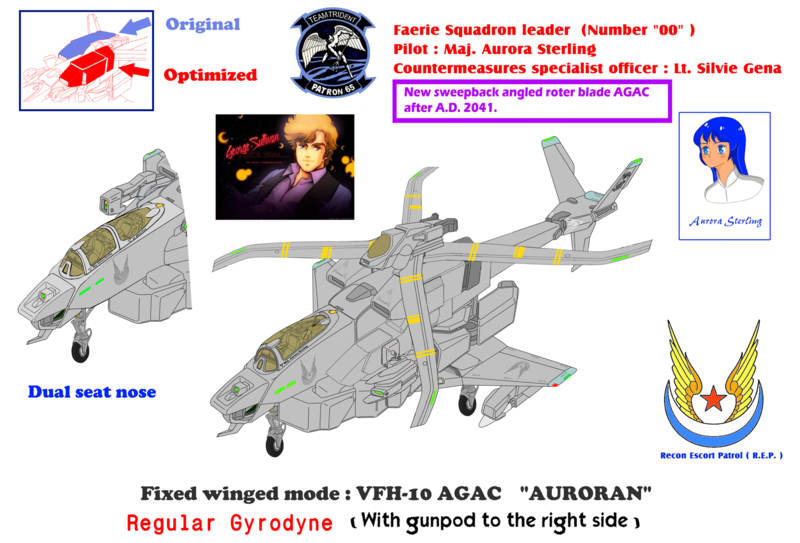 He was killed in action during the insertion of the 15th Squad on the Master's Flagship. 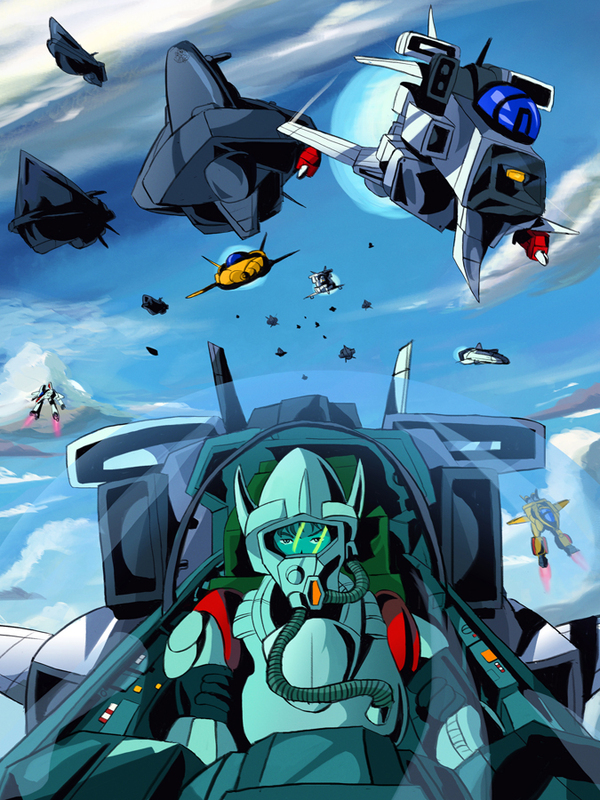 my Desktop for years. 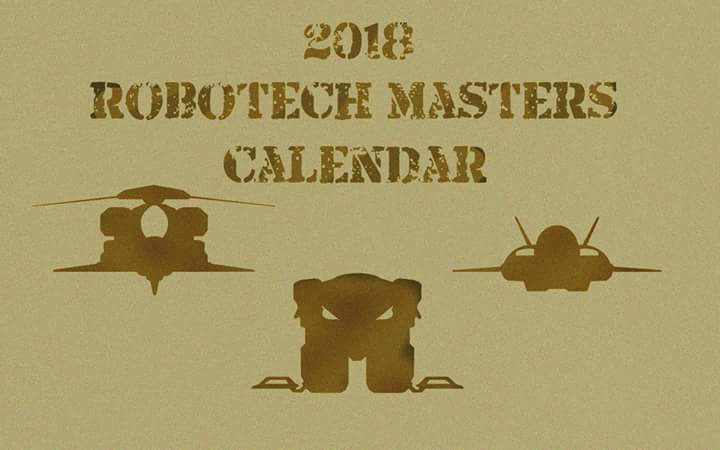 Started in 2014, I finally started to get around to finishing it. 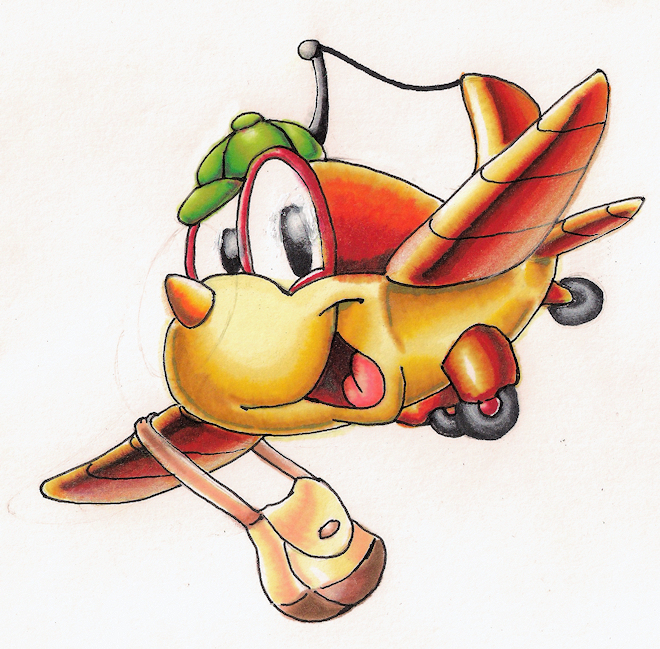 Sketched and colored in Managed Studio 5. 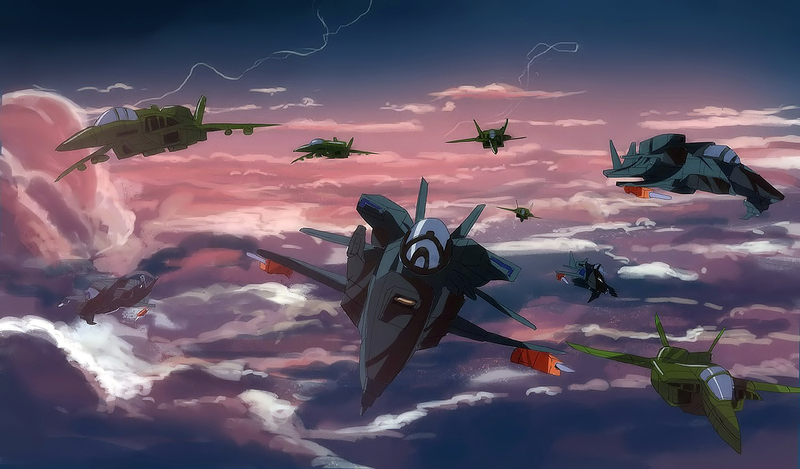 "Sounds like someone's in trouble... Let's go, WolfPack, it's time to get back in the war!" 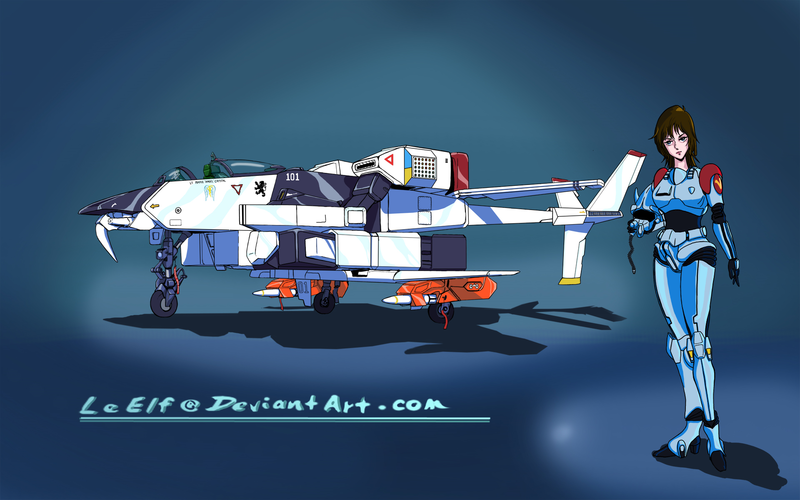 Orijinal art was posted by Kyle Dunn thanks to his artwoks and courtesy ! 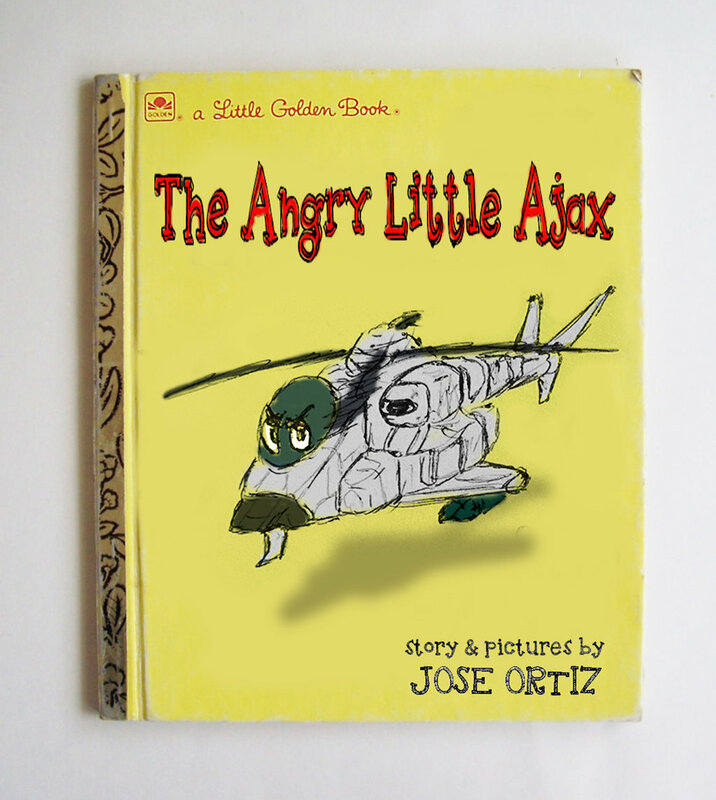 Anxious to get into the fight, the Ajax Choppers take flight as the bugler sounds the "Cavalry Charge". 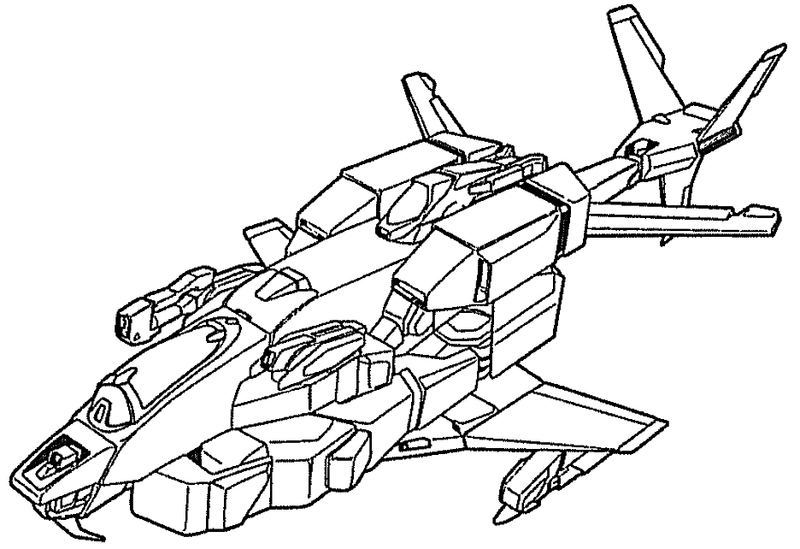 Closeup hot cycle tip jet main roter system and more stealthy shape improvement about mass-production block ! 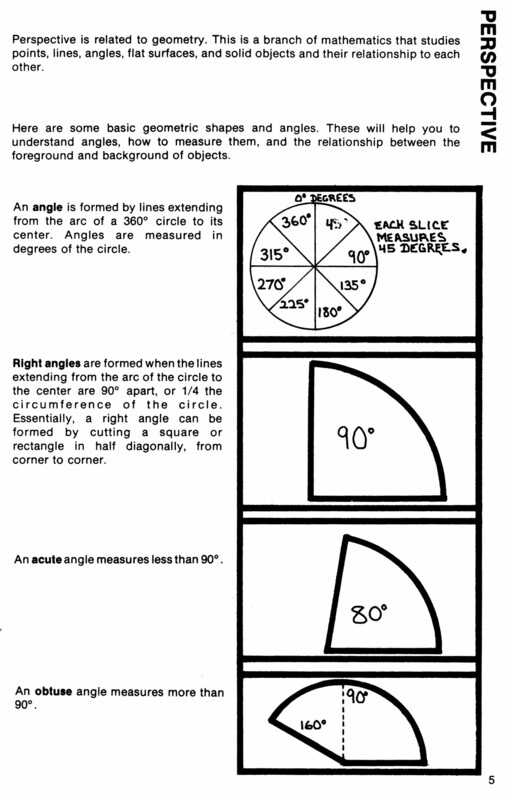 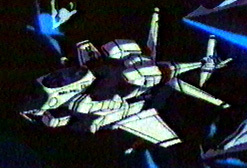 Rotor blades in the helicopter mode are present format (1984) studies are progressing from the form of jetting air from the tip of the blade. 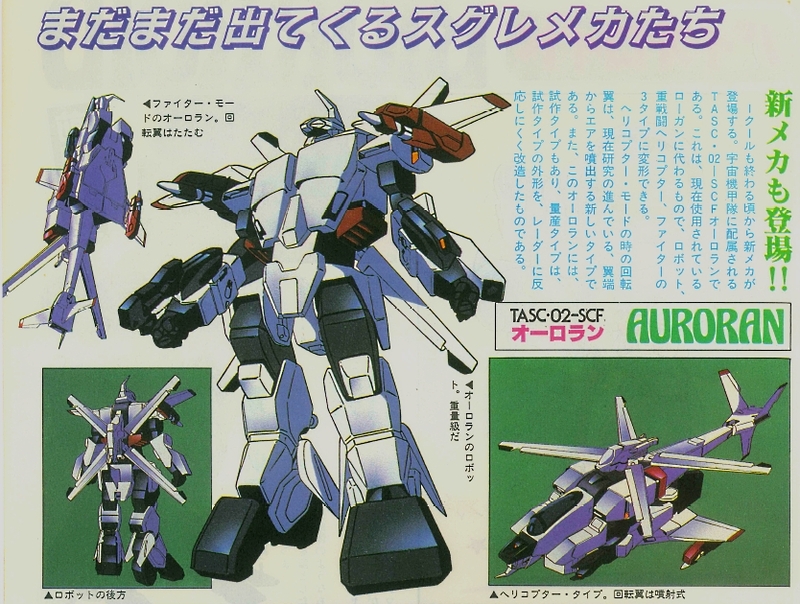 Also, Auroran has a prototype model, and the mass production type is an improvement made to make it difficult for the prototype shape to respond to radar. 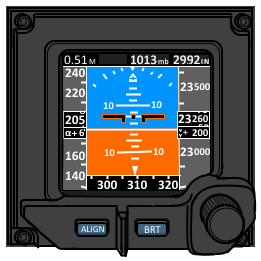 High Difefinition 1,692 pixel x 1,452 pixel image for PC. Please click thumbnail, so you can view the orijinal size ! 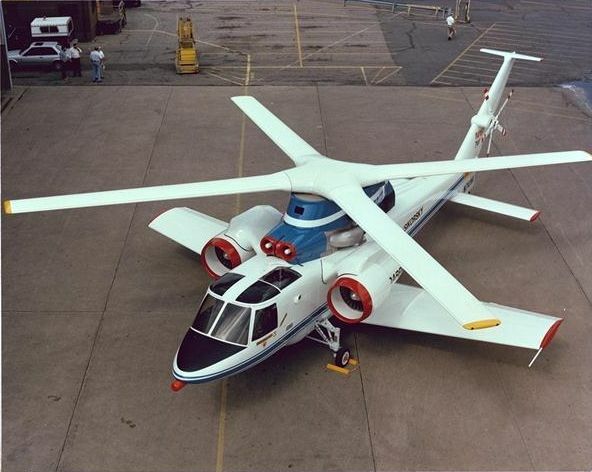 Intended to take off vertically like a helicopter, the craft's rigid rotors could be stopped in mid-flight to act as X-shaped wings to provide additional lift during forward flight, as well as having more conventional wings. 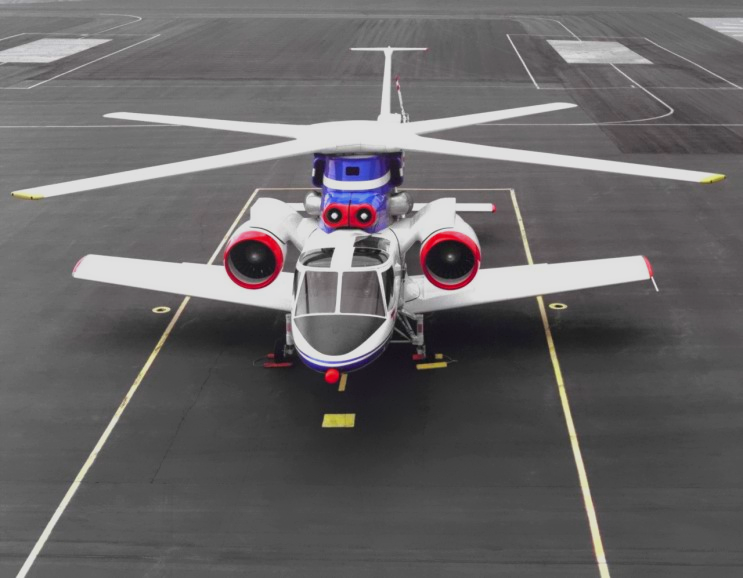 Instead of controlling lift by twisting its blades as more conventional helicopters do, the craft used compressed air fed from the engines and expelled from its blades to generate a virtual wing surface, similar to blown flaps on a conventional platform. 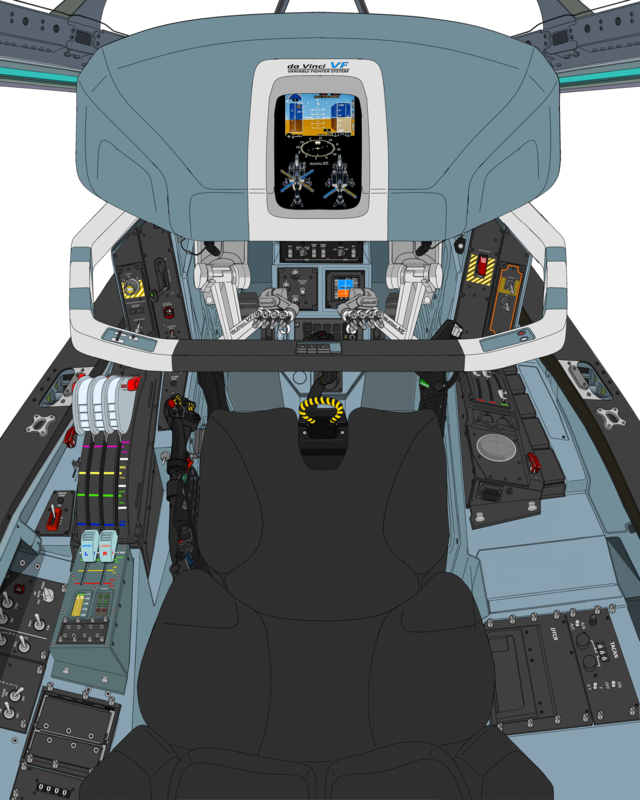 Computerized valves made sure the compressed air came from the correct edge of the rotor, the correct edge changing as the rotor rotated. 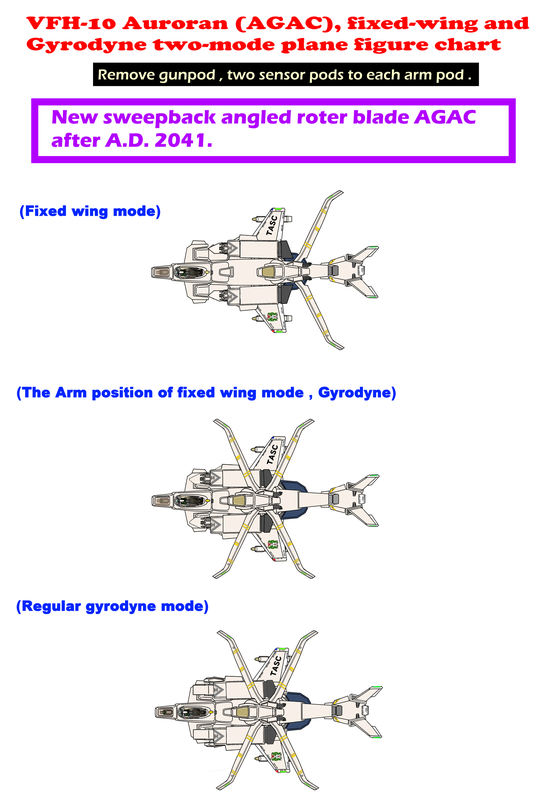 I correct "Coaxial roter" miss-used jet blast nozzle directions. 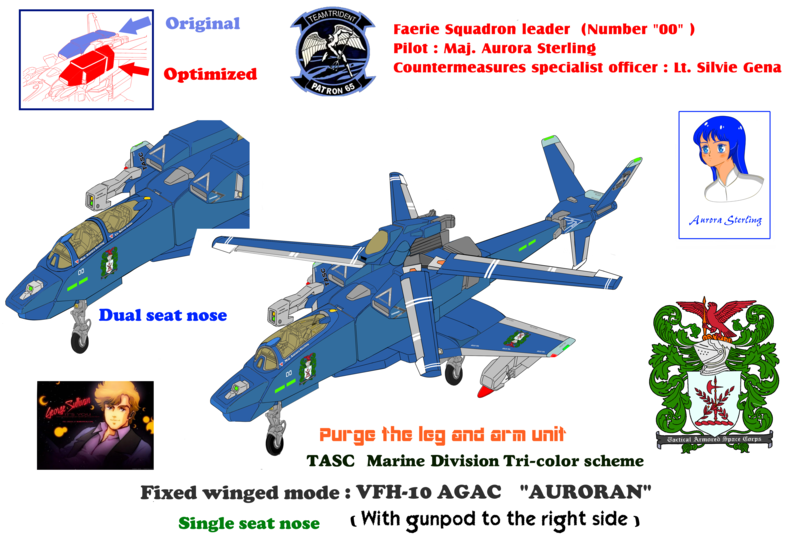 AGAC is the "First military aircraft" for hot cycle roter / tipjet system. 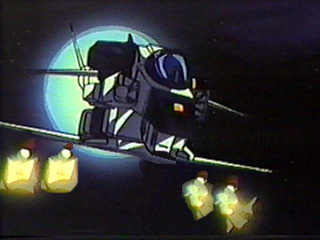 Although the hot cycling type low system was also tried in the last century, not only the heat resistance limit in material engineering but also the huge fuel consumption of the gas turbine engine, which is related to the internal combustion engine, the cruising time and the fuel cost are practical There was no. 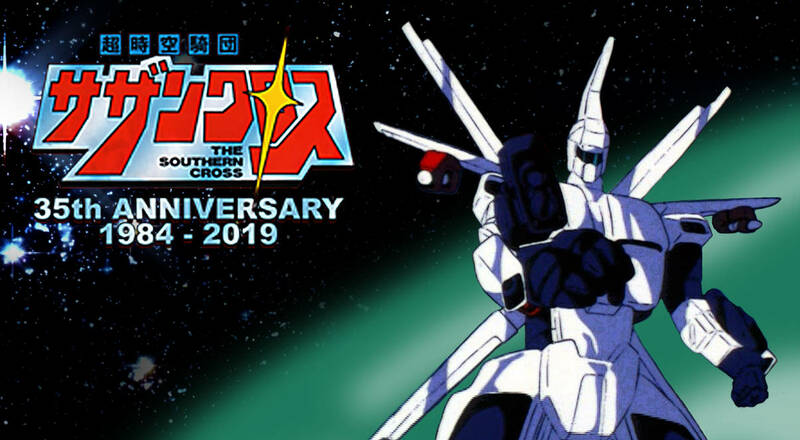 In this 21th. 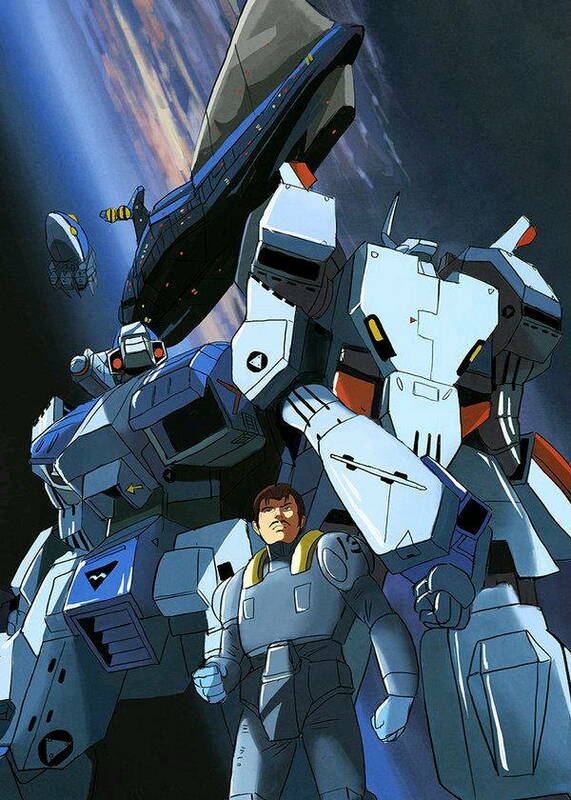 century , it revolutionized by the O.T.M. 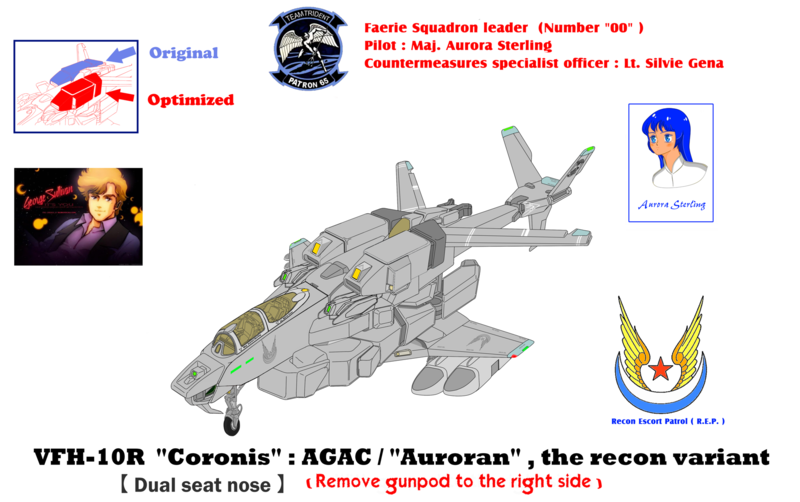 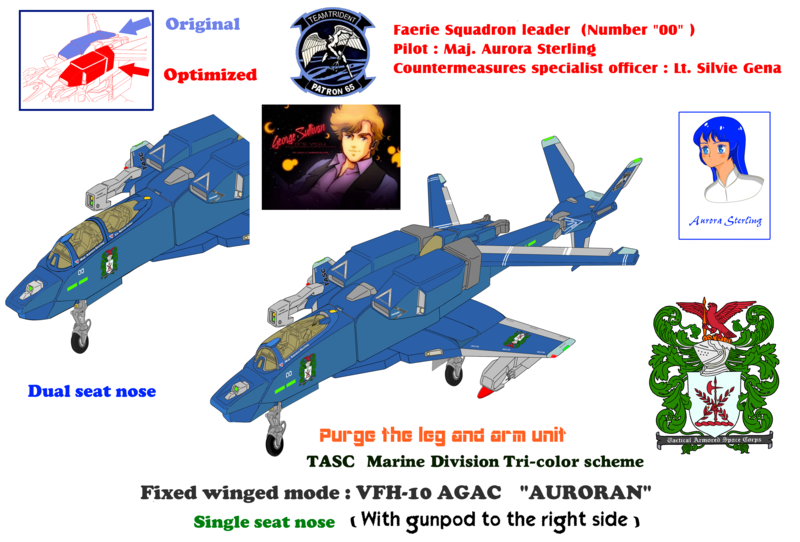 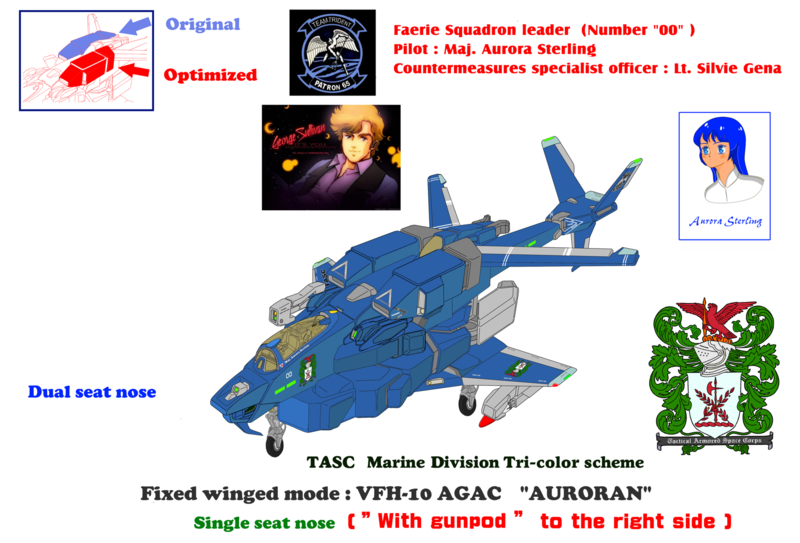 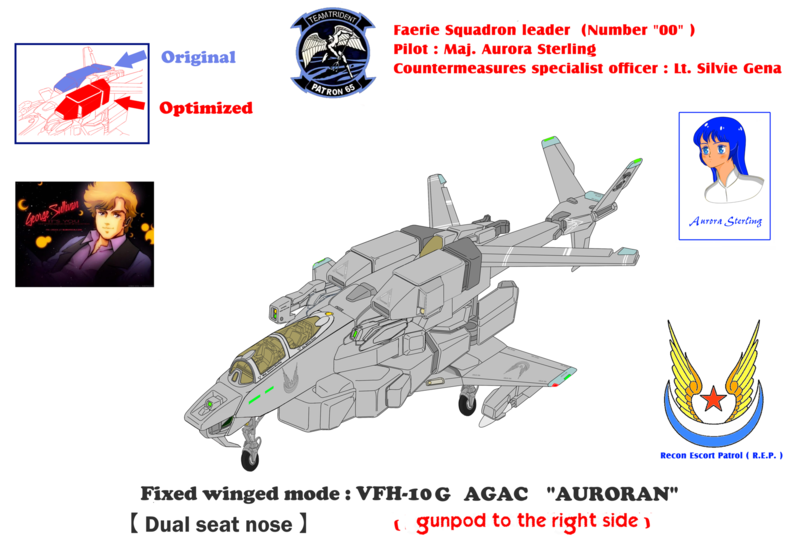 (Over Technology of SDF-1 Macross ) by Intel-mix variable cycle protoculture fusion turbofan scrum (ramjet) prime mover Pratt & Whitney JG 95B / JG 96 B series. 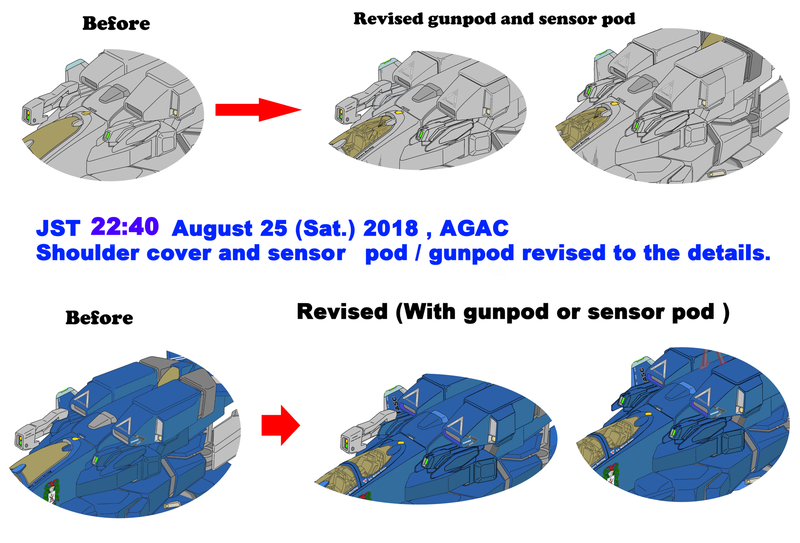 Because of the energy conversion efficiency, it became possible to ignore the fuel loading amount and fuel consumption from the past, so it was the first result that was adopted for the first time as an actual machine in this century. 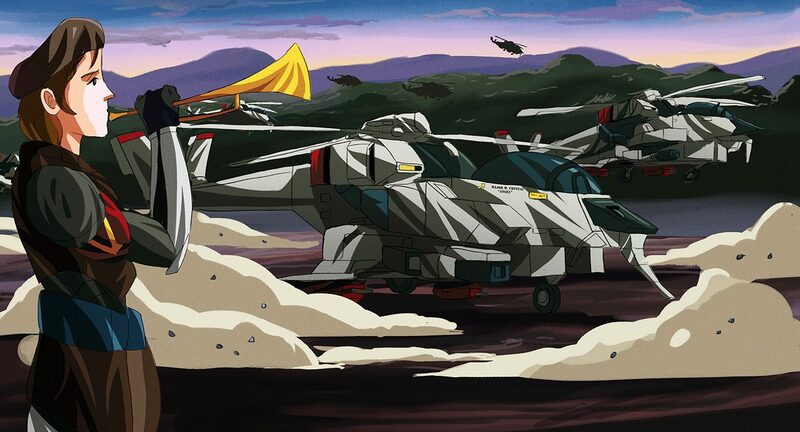 The VFH-10 Armored Gyro Assault Chopper, or Veritech AGAC, is the last mecha series developed by the Armies of the Southern Cross in the anime television series Robotech and its original Japanese source The Super Dimension Cavalry Southern Cross. 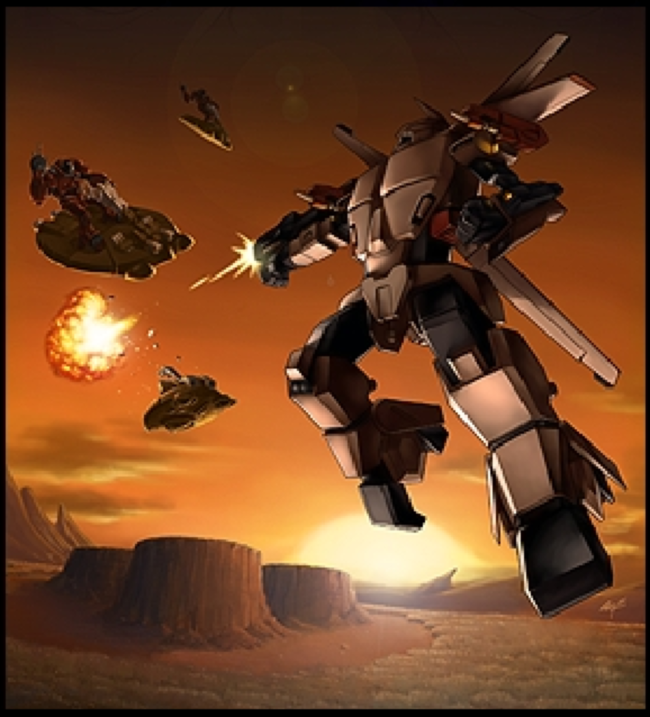 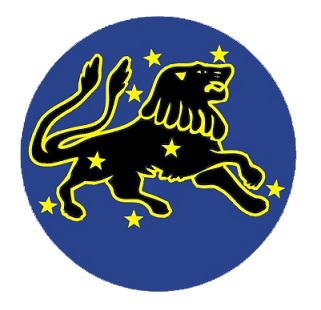 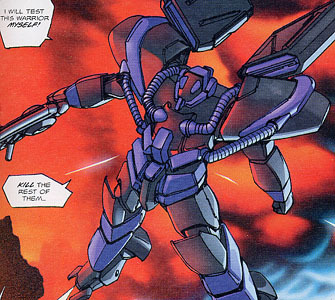 The mecha was designed as a cooperative project between the Southern Cross space forces and the ground forces, and is equally at home in space or attacking enemy forces near the ground. It does not shine as an atmospheric fighter, although it is certainly no slouch in that regard. 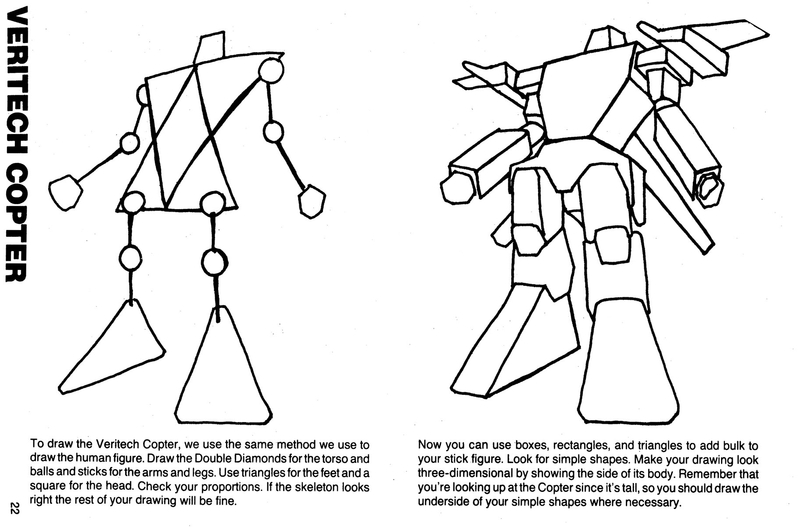 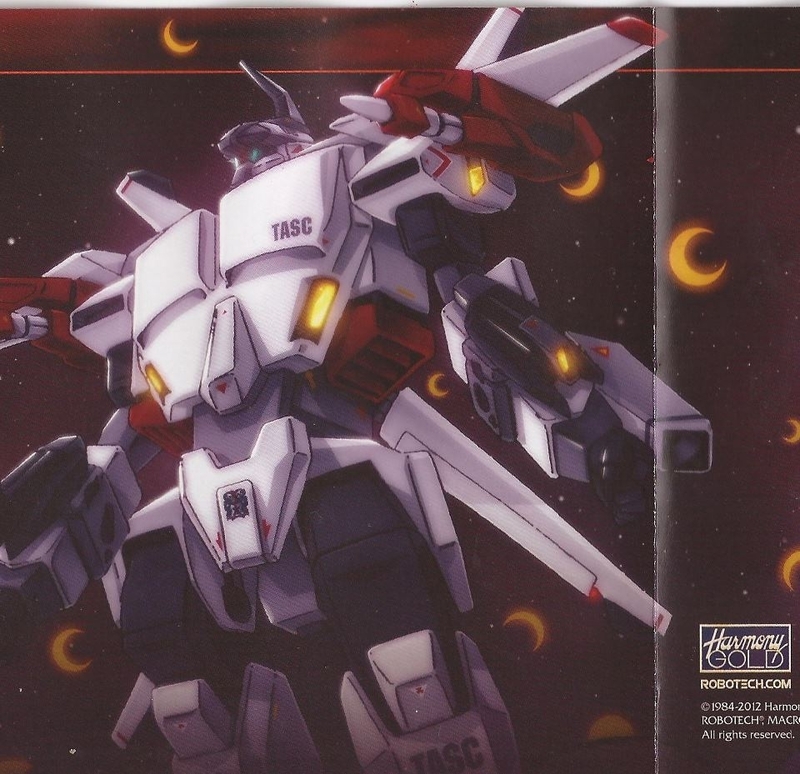 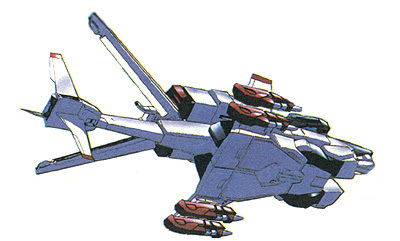 Large numbers of the AGACs (commonly pronounced Ajax) were built by the Southern Cross, almost all falling to either the Robotech Masters or the Invid. 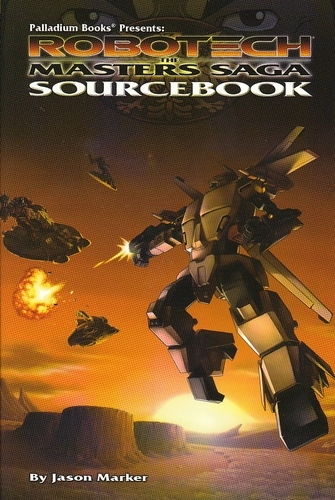 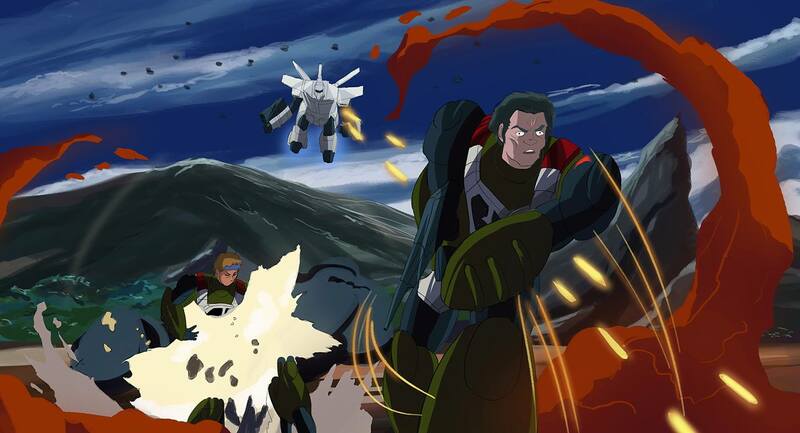 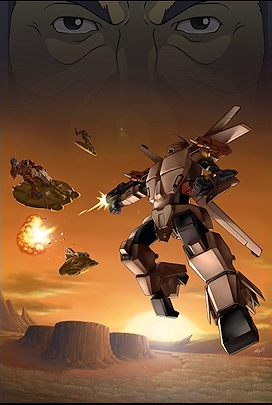 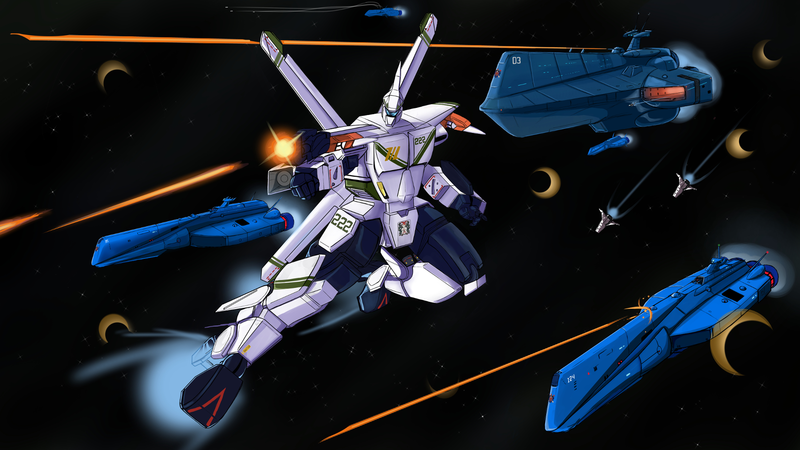 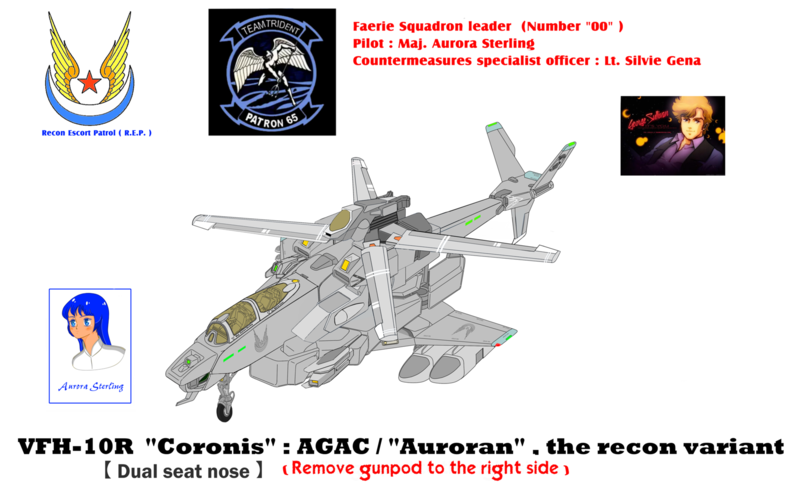 The space forces mostly use the Fighter and Battloid modes; the ground forces use the AGACs mostly as an attack ship in its Helicopter mode and also as a Battloid. 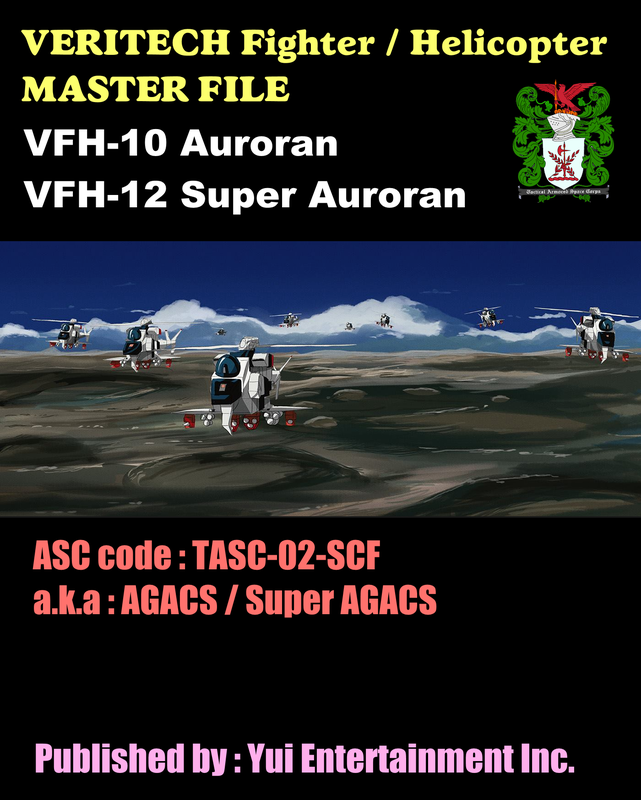 Most AGACs were assigned to the space forces to replace losses. 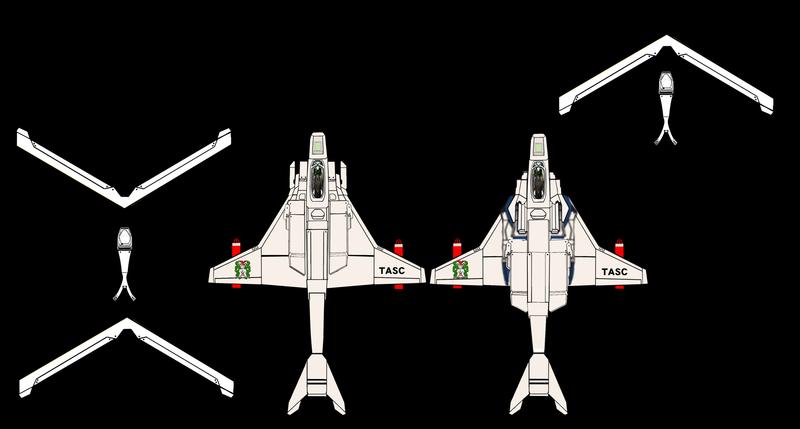 The AGAC is rarely used as a high performance fighter, which it is not designed for. 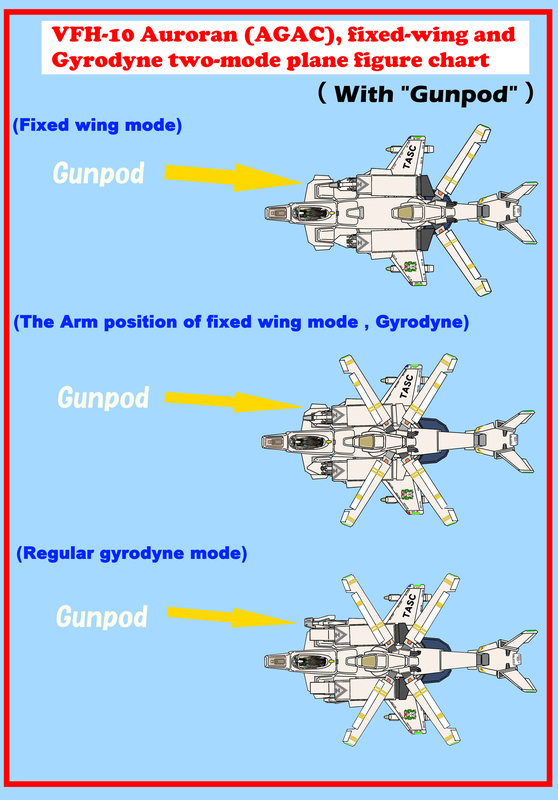 In space its many engines give it good acceleration and superb control, and its multiple beam cannons can fire without loss of effective range due to the atmosphere. 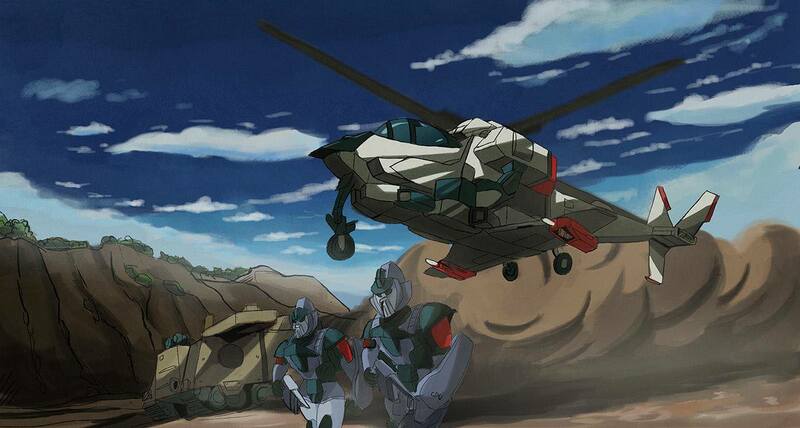 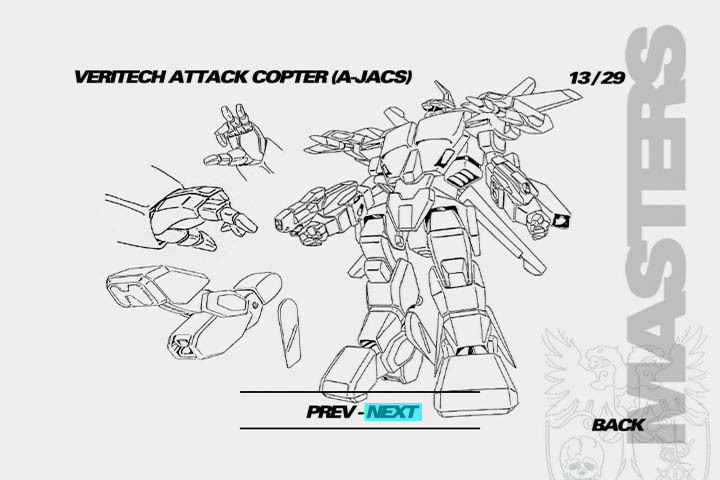 Near the ground, the Helicopter mode makes it possible for the AGACs to hover behind cover more effectively than earlier veritechs, because it is less high than Guardian modes. 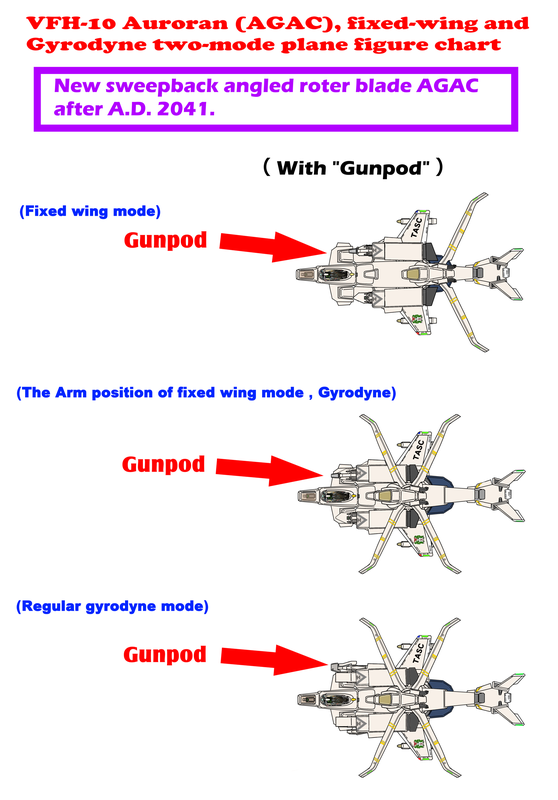 Its beam cannons still work well at medium ranges, and its missiles are very effective both in space and near the ground. 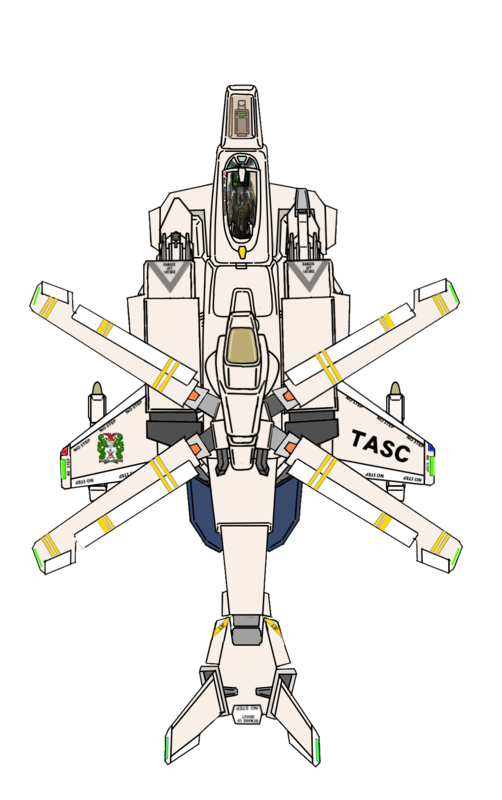 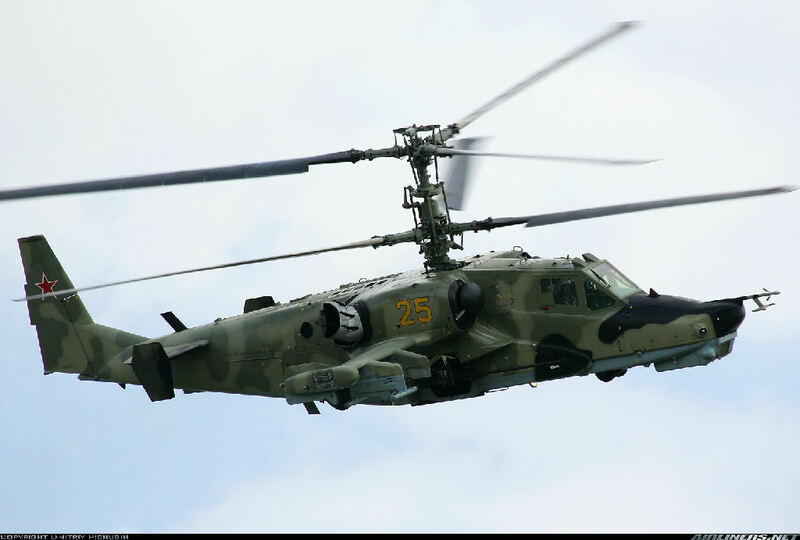 The transformation from Fighter to Helicopter mode is less extensive than other transformations of veritech fighters; as a result, the AGACs could be kept relatively small and simple. 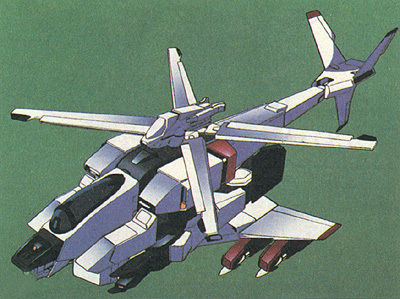 To avoid having to built in a tail rotor, the designers gave the Helicopter mode contra-rotating rotors; and to resist enemy fire from the ground, the underside of the wing box was reinforced. 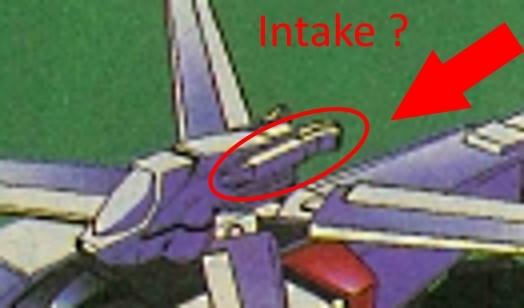 In Battloid mode, this base forms the chest plate of the robot, although during transformation, this part of the mecha is very vulnerable. 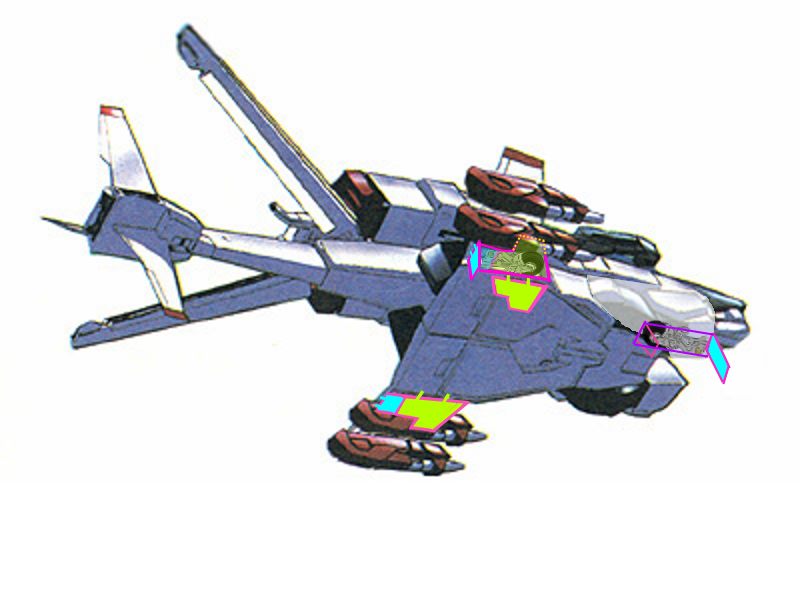 Almost all its weapons are mounted in gun or missile pods, for ease of maintenance and switching. 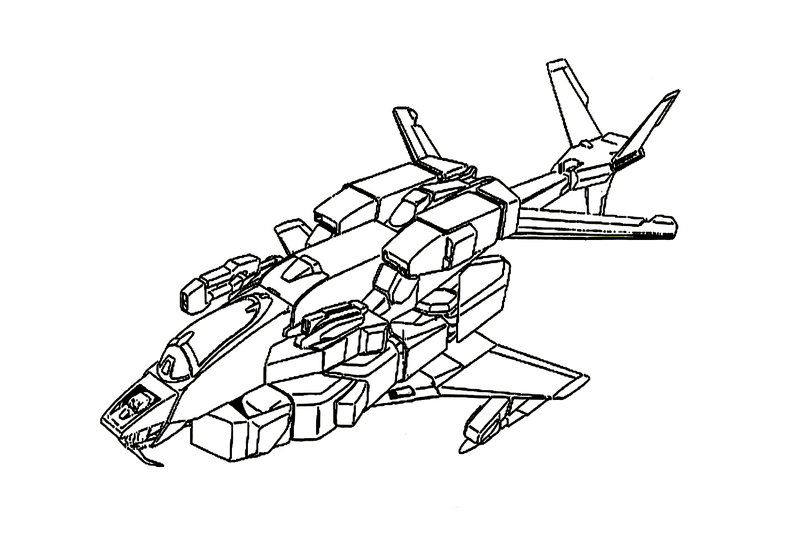 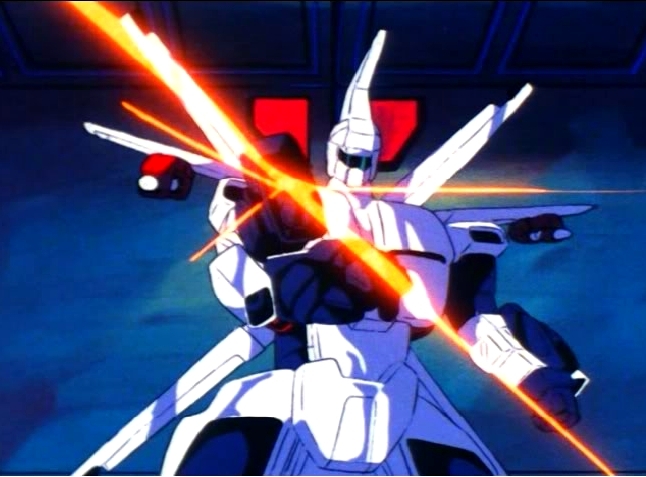 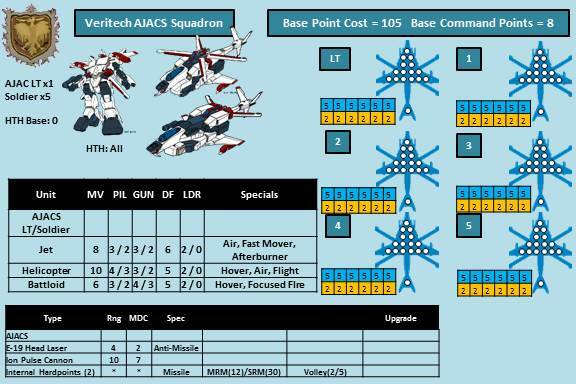 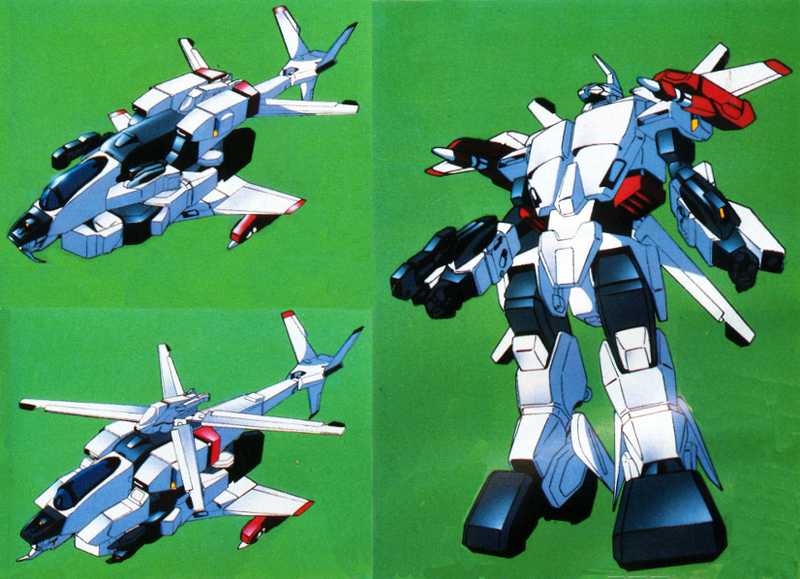 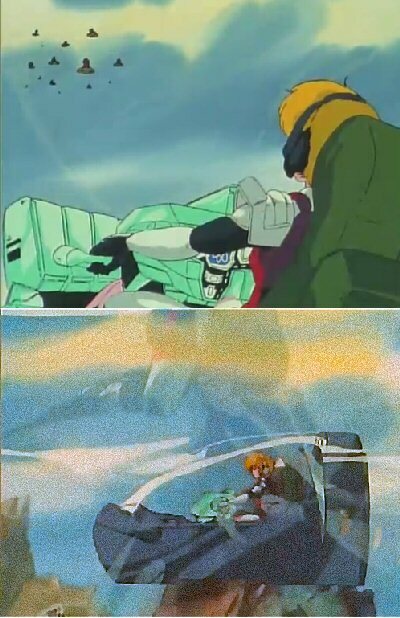 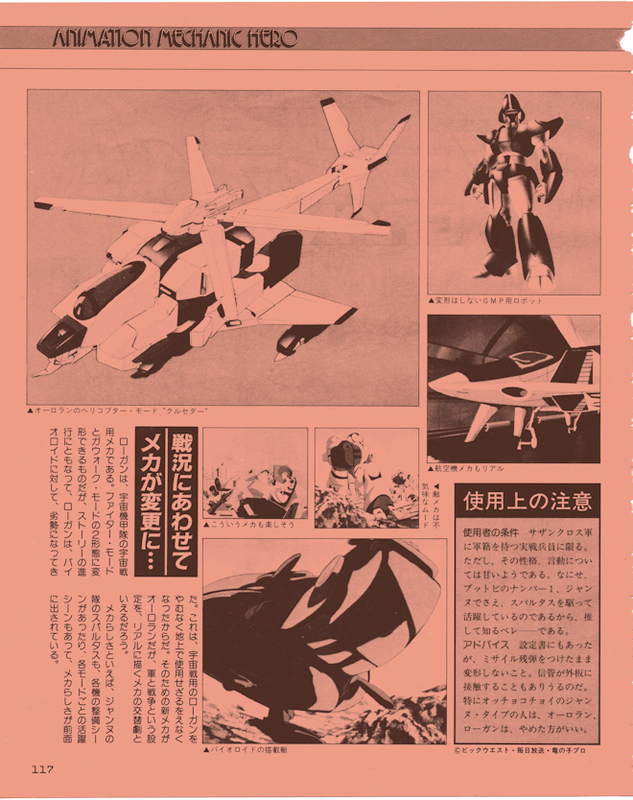 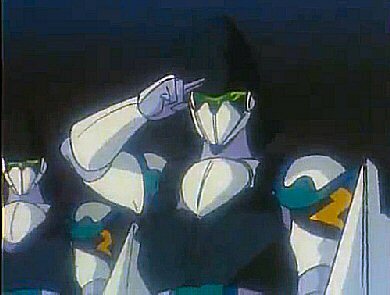 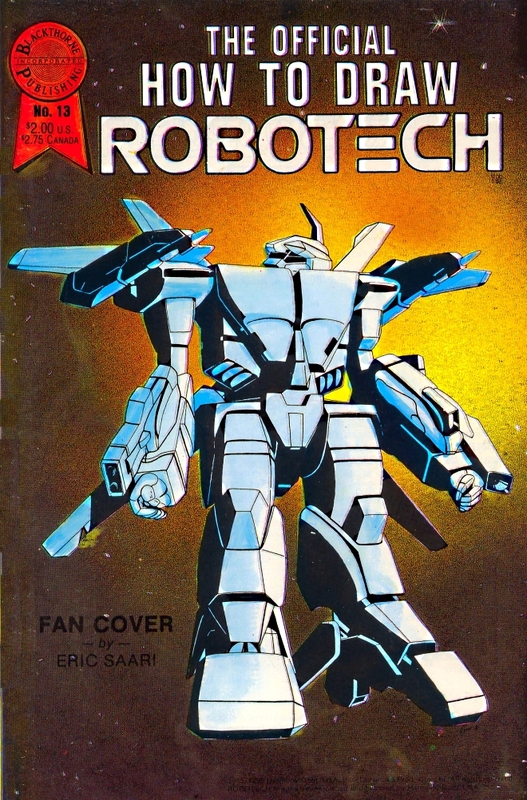 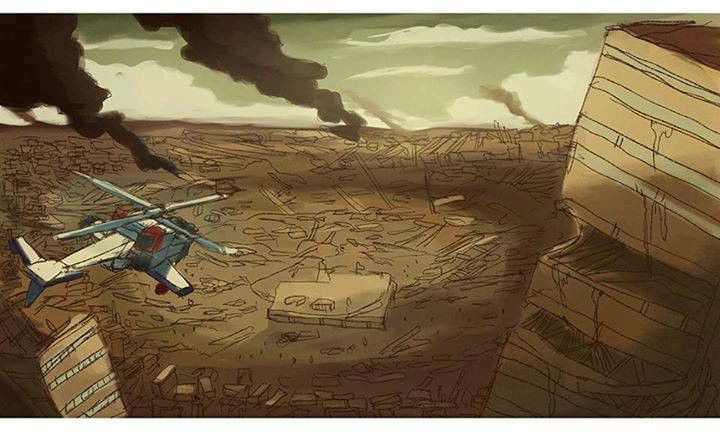 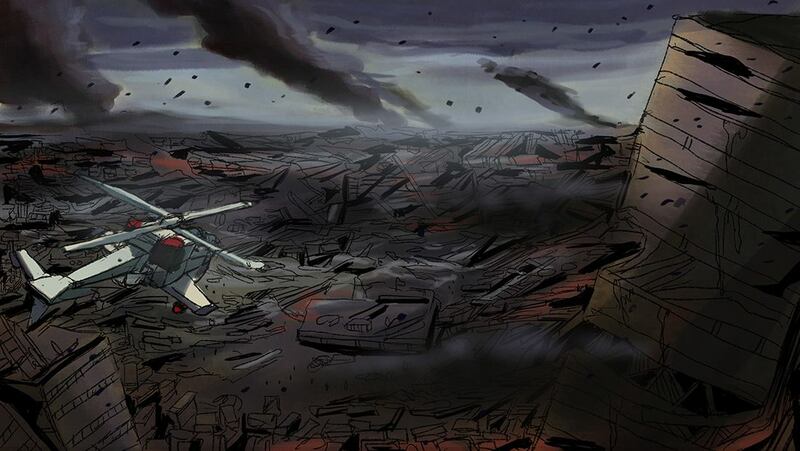 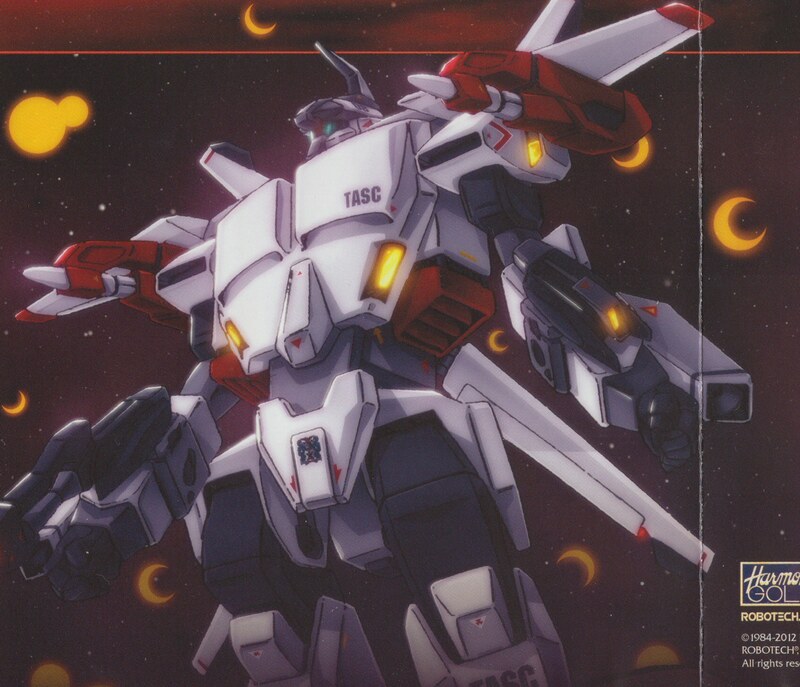 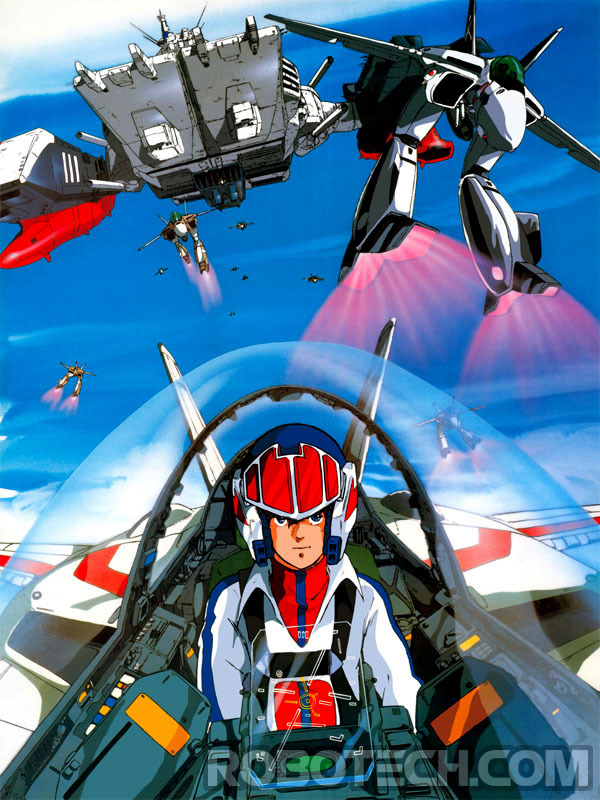 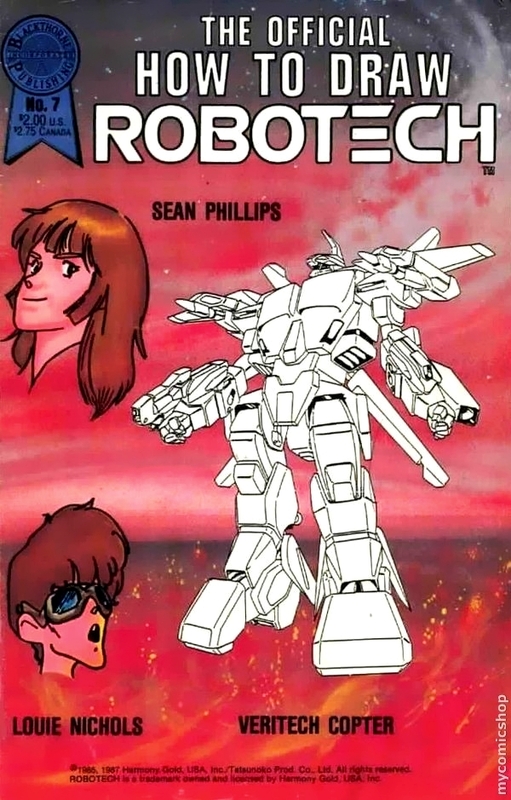 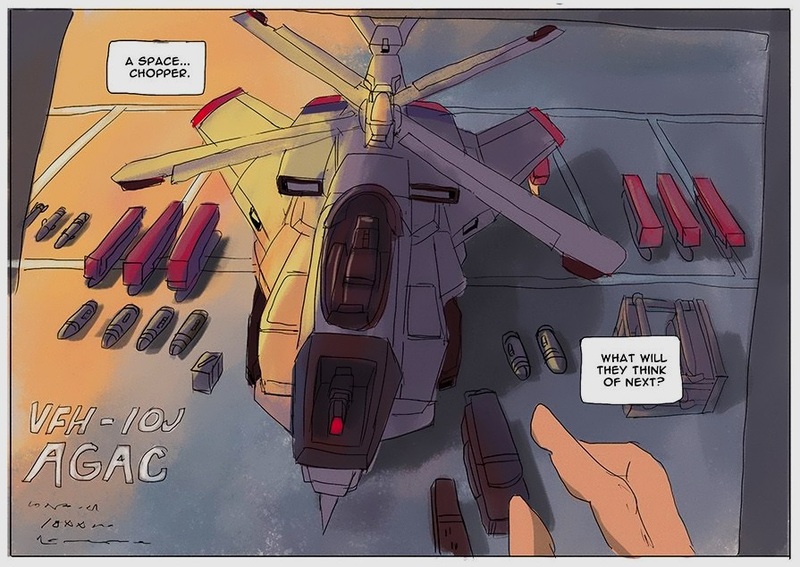 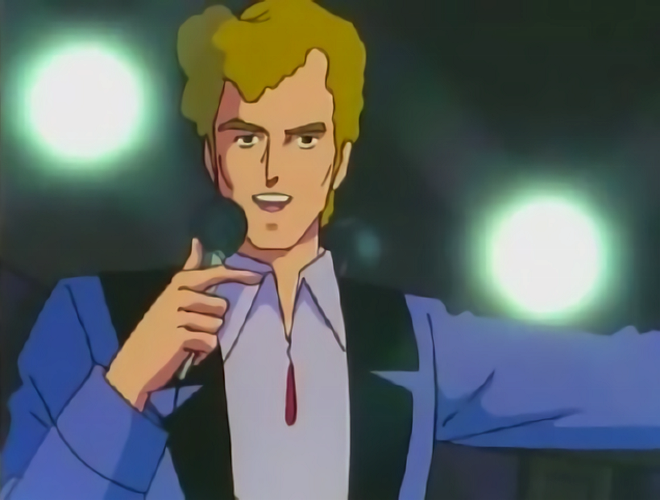 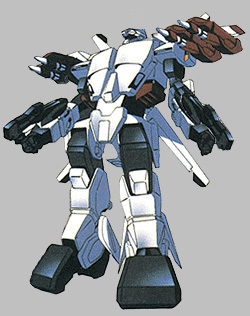 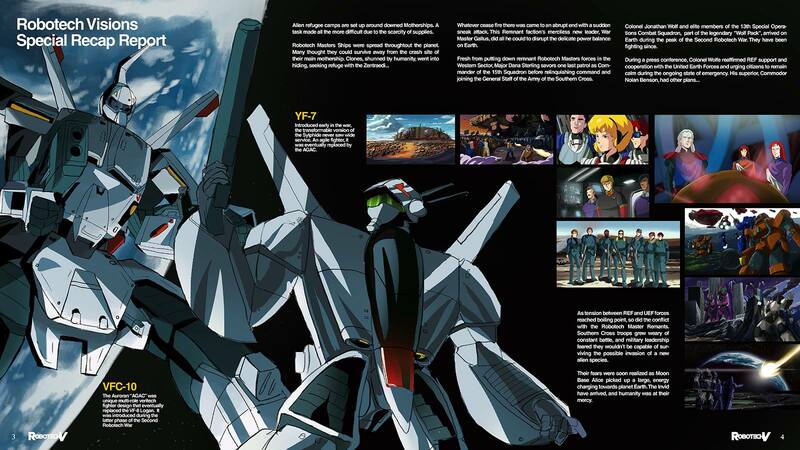 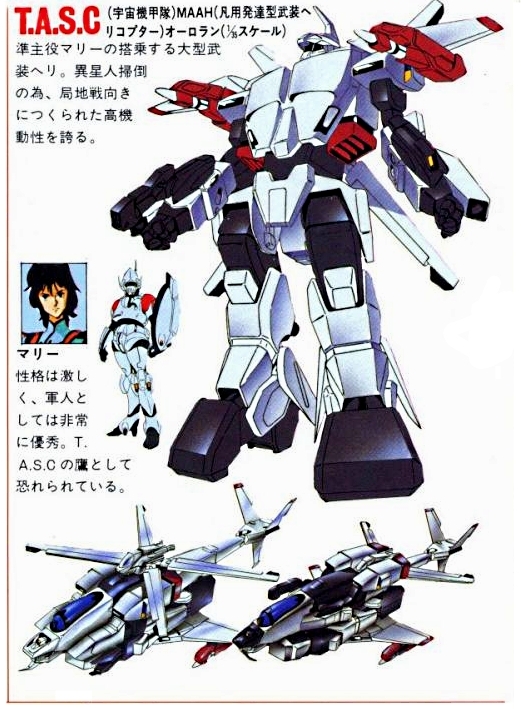 In all, the AGAC is a successful design, although it suffered grievous losses against the Robotech Masters, along with all other Earth mecha and ships.